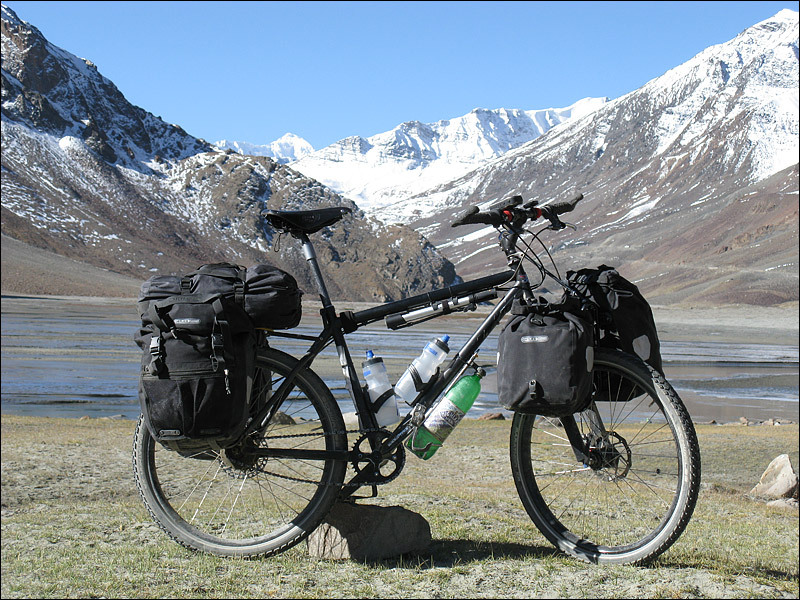 Bicycle touring in the Himalayas | What happens if I press THIS?? Many years ago I was wandering round a jumble sale, and found a book on the 50p stall by Kym McConnell entitled ‘Tibet Overland’. I couldn’t resist buying it, for no reason other than it would look pretty cool lying around on the coffee table at home. However, after leafing through it a couple of times, I started to wonder. One day in 2007, I was parking my bike outside of work in the morning, and bumped into Ulrike, a colleague and close friend. 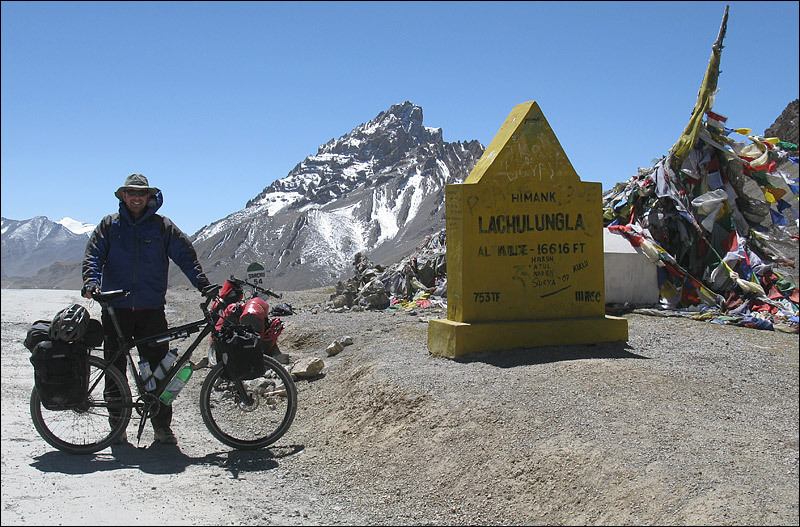 I don’t know what came over me, but I found myself saying, out loud… “I’m thinking about going on a mountain bike trip to Everest Base Camp”. And before I could splutter a hasty withdrawal, Ulrike squeaked with excitement: “I WANT TO COME!!”. Doh! 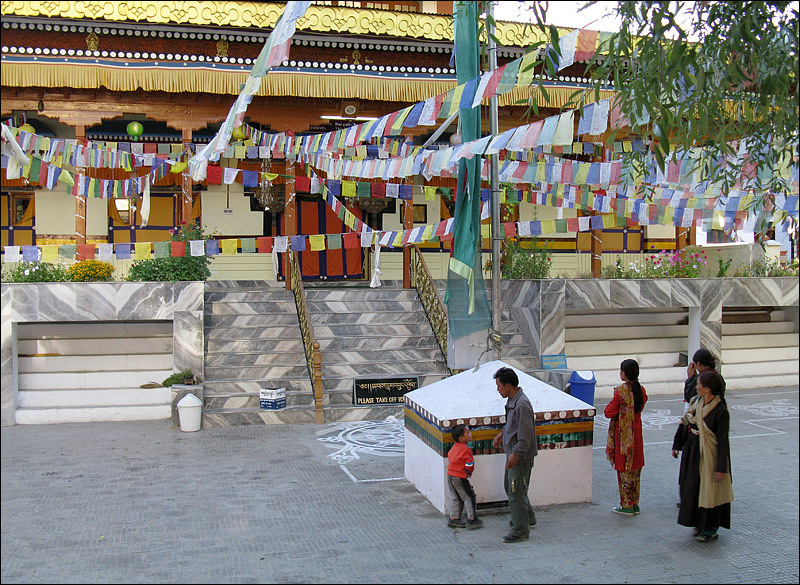 After many more conversations and some proper research we decided that, given the political turmoil in Tibet at the time, it might be better to go to Ladakh instead – it’s just across the border, and a refuge for many of the Tibetan Buddhists who have been pushed out of their homeland. 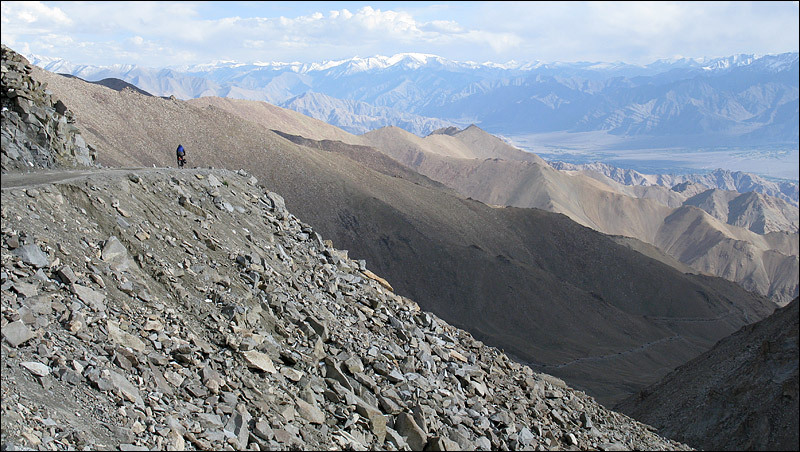 When we also found out that we could include the highest road in the world (Khardung La) on our route, we were both completely sold on the idea. I bought the tickets, and everything else was building bikes and buying gear. Exciting! Map: India North (Nelles 1:1,500,000 series). 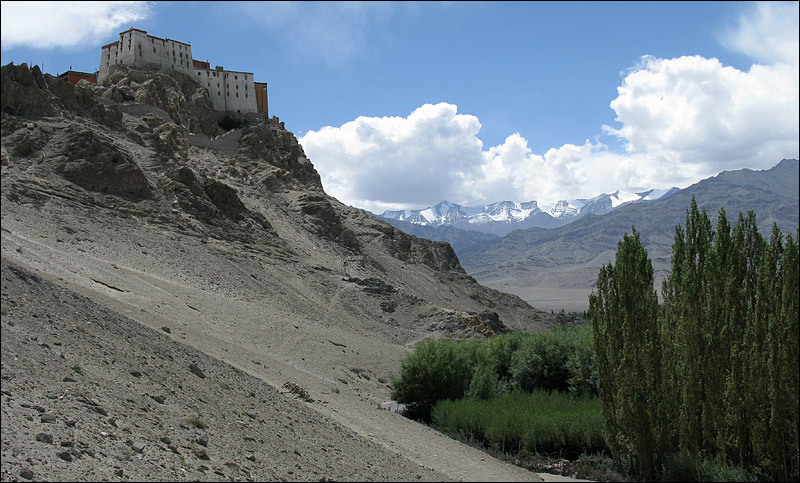 We also used the three ‘Editions Olizane Carte de Trekking’ Ladakh-Zanskar 1:150,000 maps. 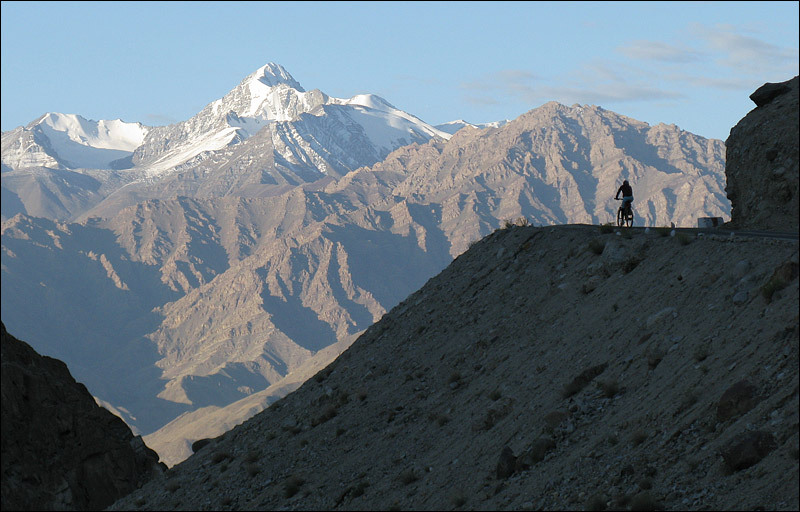 The morning flight to Leh was spectacular, but a bit intimidating once we realised we were going to have to cycle through the mountains below! We were lucky and had seats on the left hand side of the plane – the sunrise shines straight in the right hand side. They’re not visible in the photo above unfortunately, but from the plane we could see K2, Broad Peak, the Gasherbrums and Nanga Parbat. 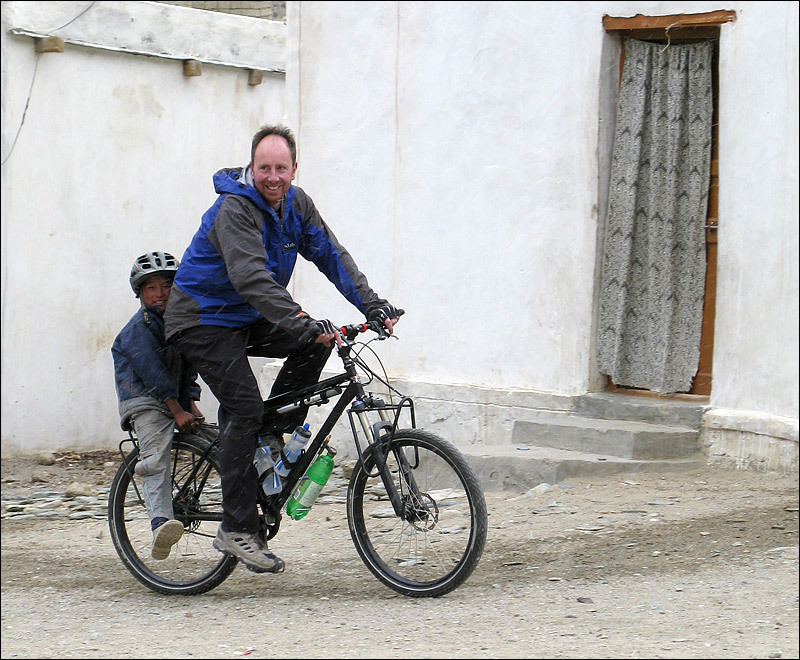 To help with acclimatisation, and as a bit of a warm-up, we went for a short ride on the Srinagar road. Just one day out, camp, then one day back again, but it was much harder than I thought it’d be. 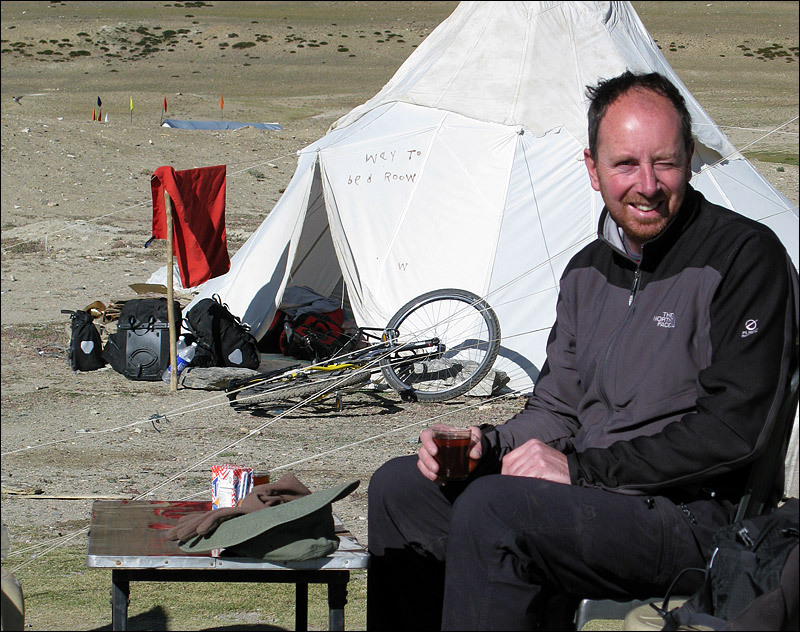 The sun was fierce, and we were both still a bit breathless while we were acclimatising, and I was recovering from a bit of altitude sickness (see the Diamox notes on the Kitlist post). It’s a great road, and if it hadn’t been for terrorist activity in Srinagar it would have been really good to carry on in that direction for a while. 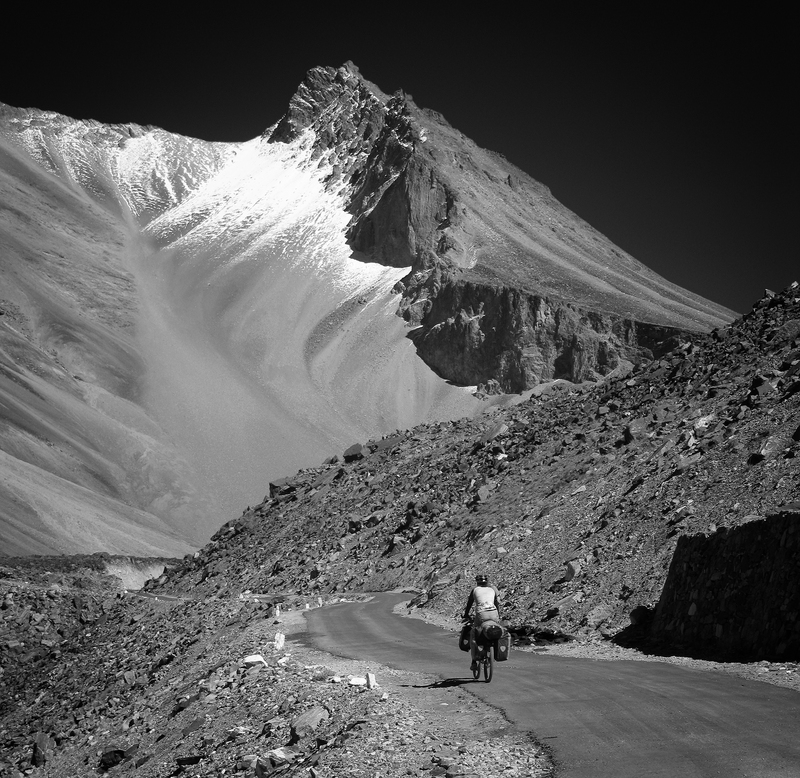 The descent into Nimmu, where we camped on our warm-up ride. 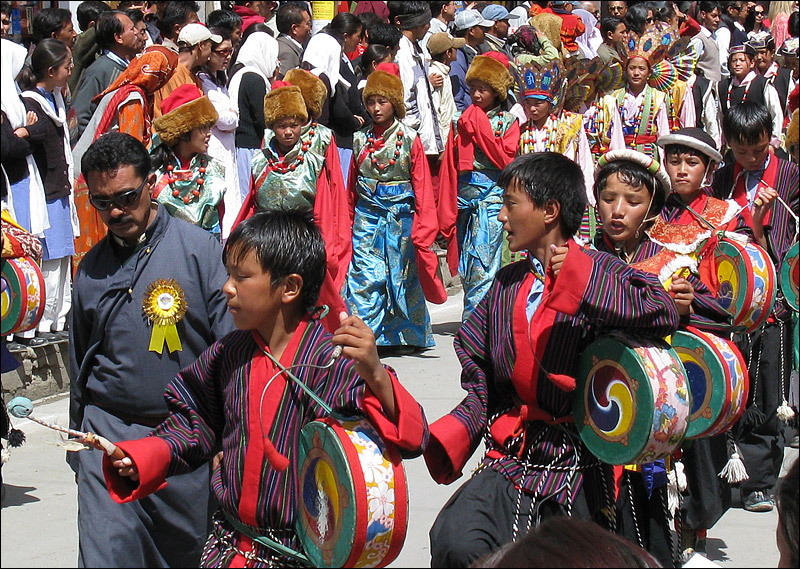 We timed the warm-up perfectly – the day after we returned was the first day of the Ladakh Festival! 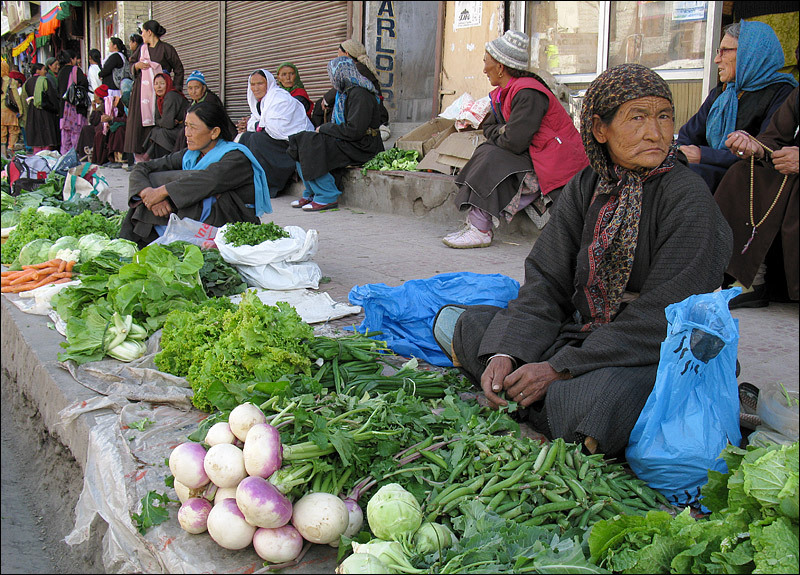 Even the old ladies who sold vegetables at the roadside, normally grumpy and reluctant to allow photography, were slightly more cheerful than usual. Slightly. 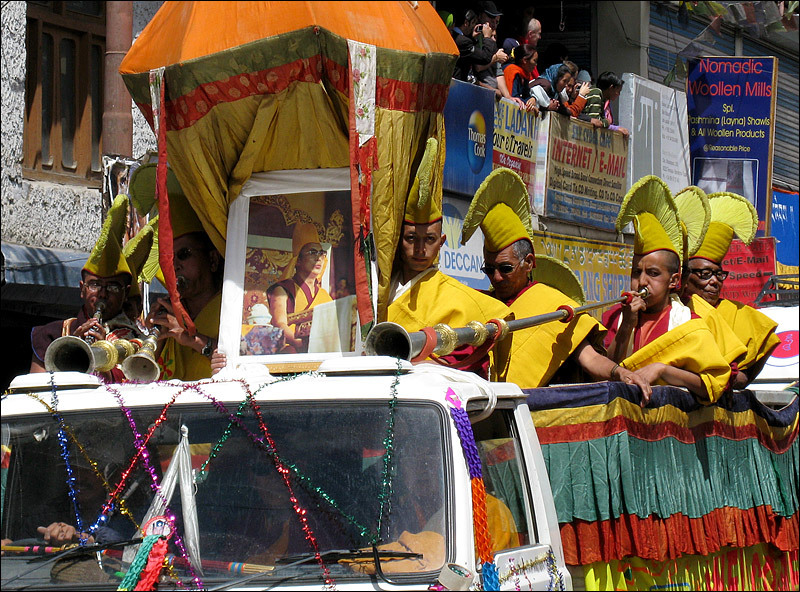 The next few photos are from the opening procession through town. 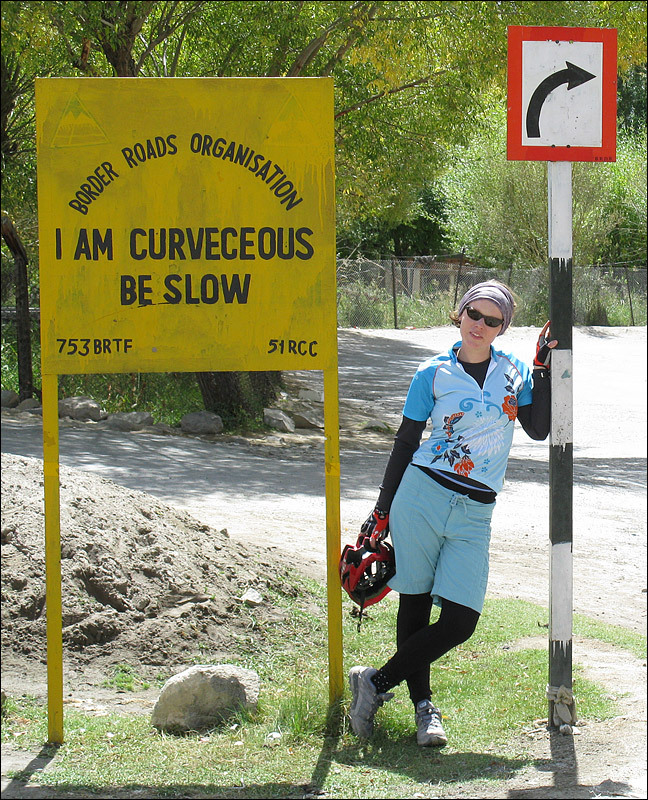 The day after the festival, we cycled up to the top of the Khardung La pass – the highest motorable road in the world, apparently! My GPS reckoned it was about 5,400m, but other estimates are as high as 5,606m. 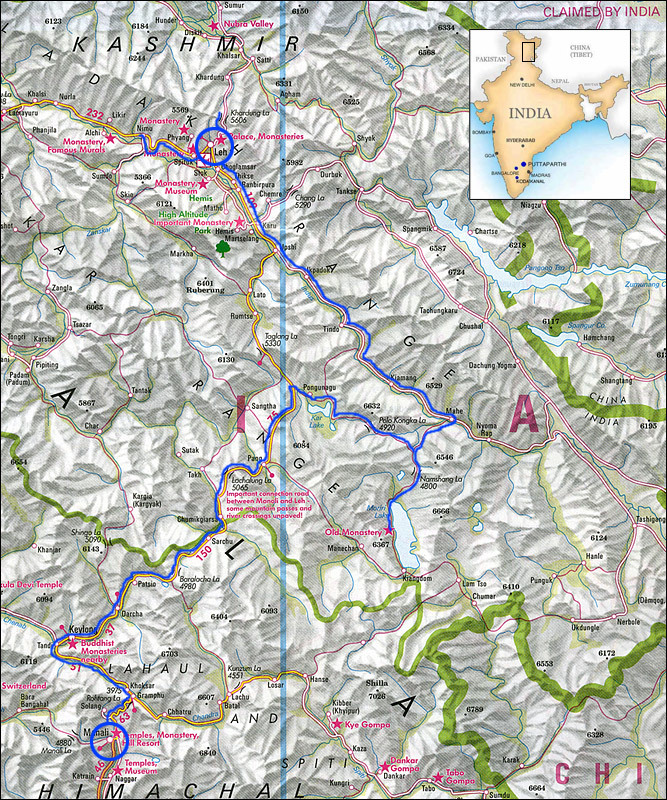 Whatever the actual altitude, it’s about 2km of vertical ascent over a total distance of 37km. At altitude, that’s pretty hard work and a big day out! 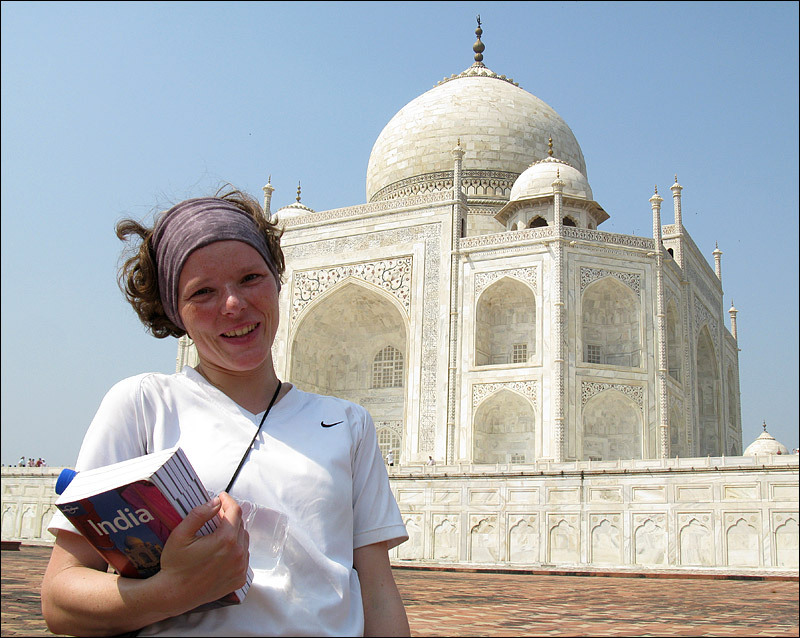 We’d planned to set off at 5.30am, but a bout of food poisoning kept Ulrike in the bathroom for an extra hour. 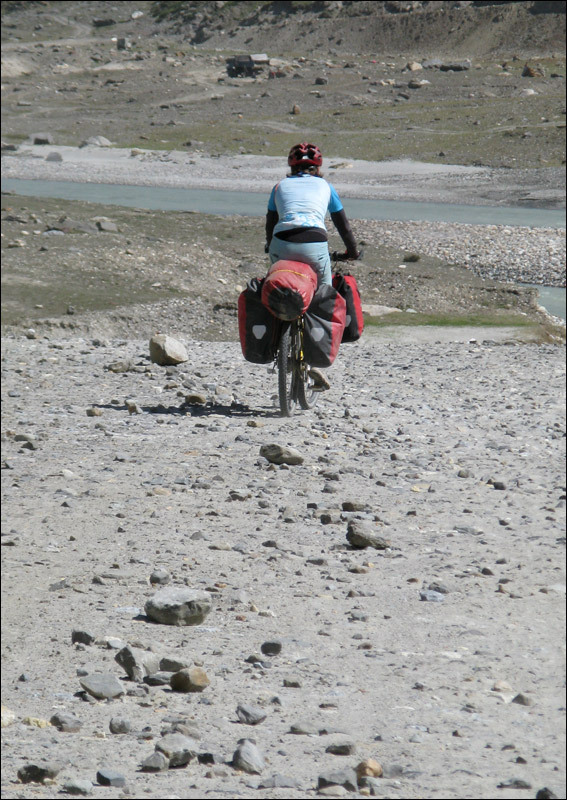 Full marks to her for getting on the saddle at all, let alone getting up the climb with an empty stomach. The photo above is very near the start, just a couple of km out of town. 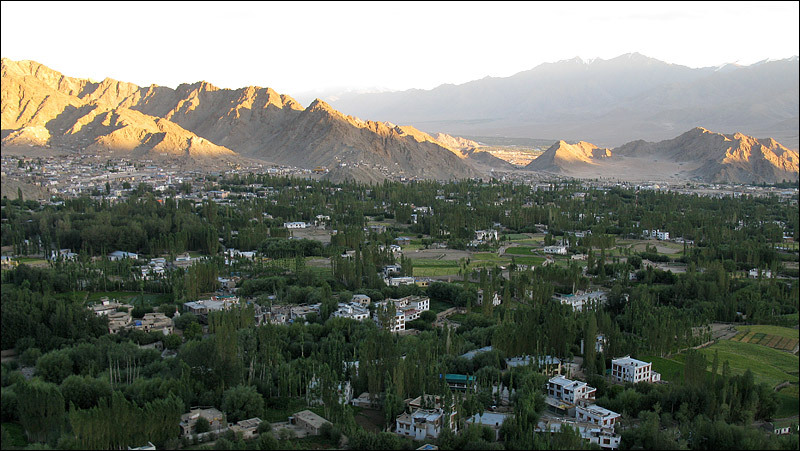 We’d originally planned to take full luggage over the top and stay in the Nubra Valley for a day or two, but decided to forego Nubra and make time for Tso Moriri later in the trip, so we travelled light with just one bag each. Good call! On the way back down. The top section of the road (10-15km) is pretty rough and interesting, but after that it improves and becomes more of a fast adrenaline ride – great fun, but a bit exciting around some of the hairpins! In the bottom right of the photo you might be able to pick out a convoy of military trucks on the road – I reckon they’re about a third of the way down the road. It’s a big day out, and I’m glad we had a hot shower and one more night in the comfy house before setting off on the road south. 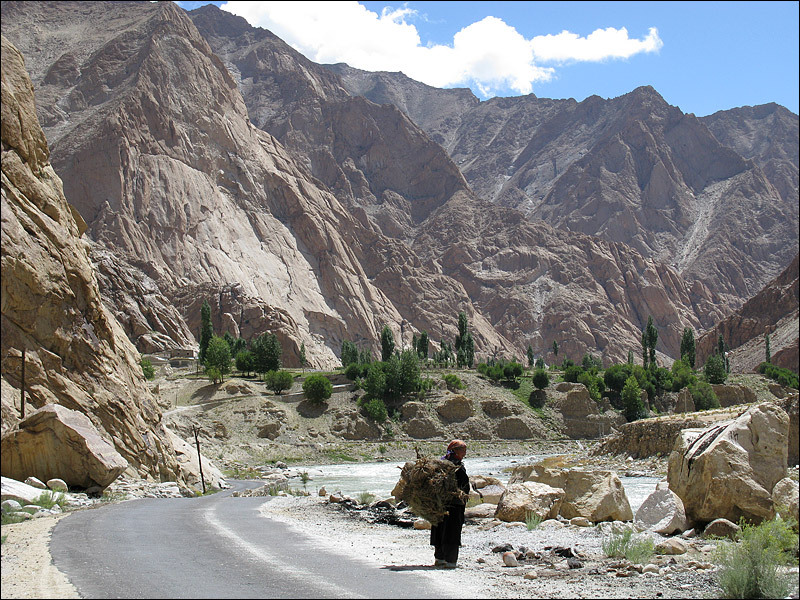 On the road to Upshi (near Shey Palace), on the first day of our proper trip. Ulrike was quite tickled by this roadsign. 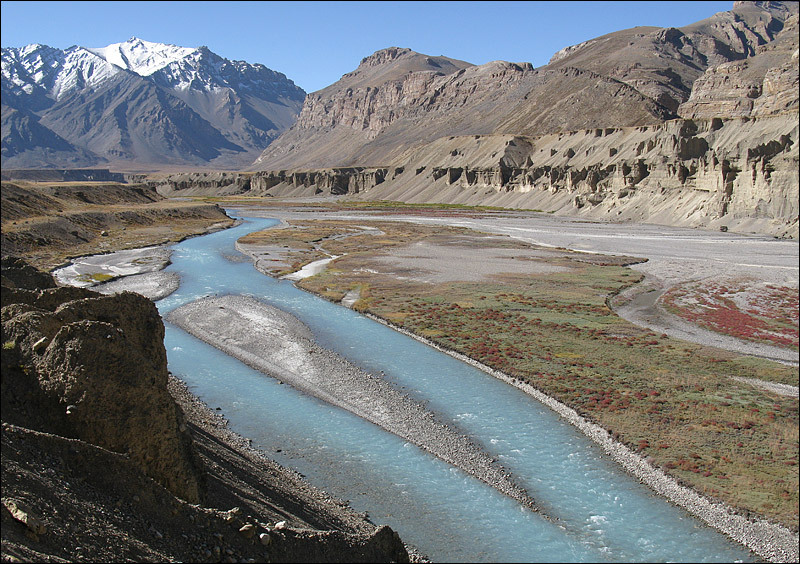 Somewhere else in the Indus Valley! 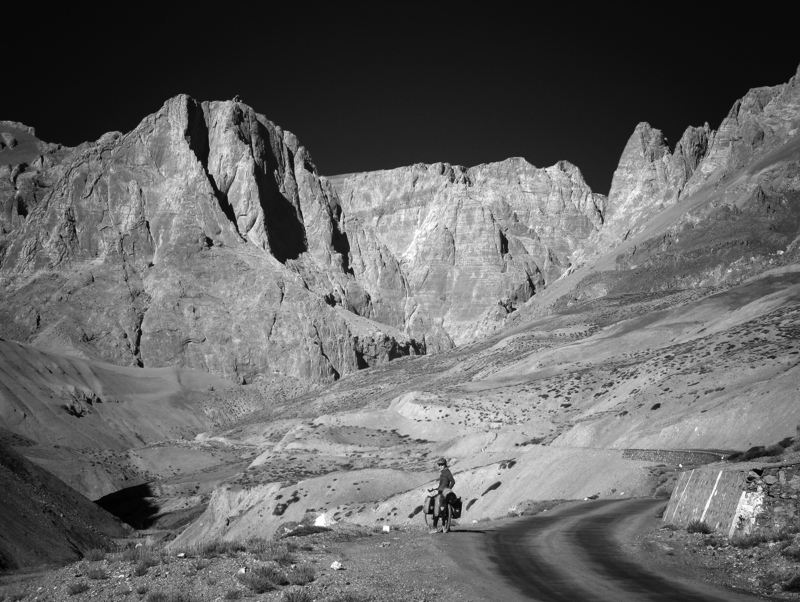 On the third day of our route along the Indus valley, where we saw only a couple of vehicles every day, one jeep pulled over in front of us, and out jumped Elisabeth Gaul (a retired German lady we’d met in Delhi and Leh), along with a Tibetan Nun and their guide. 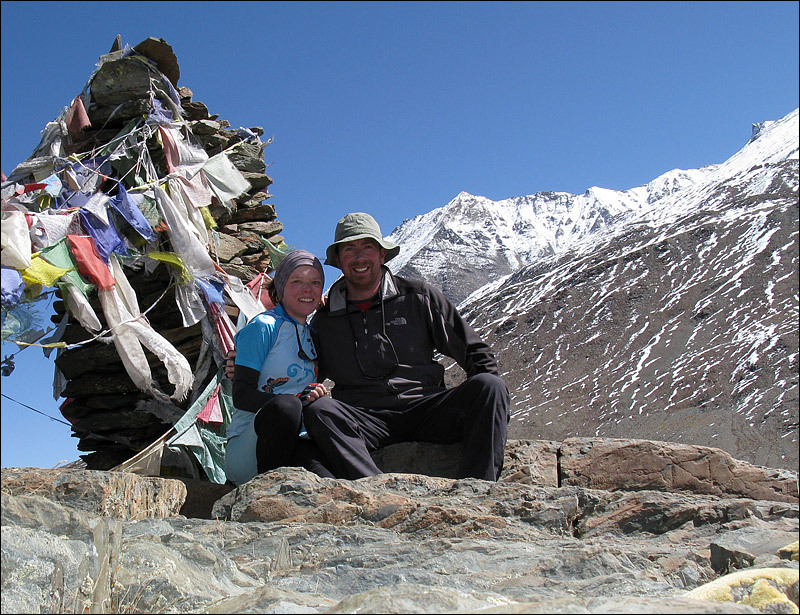 Elisabeth has travelled to Leh every year for the last 30yrs (her first trip was with Heinrich Harrer! 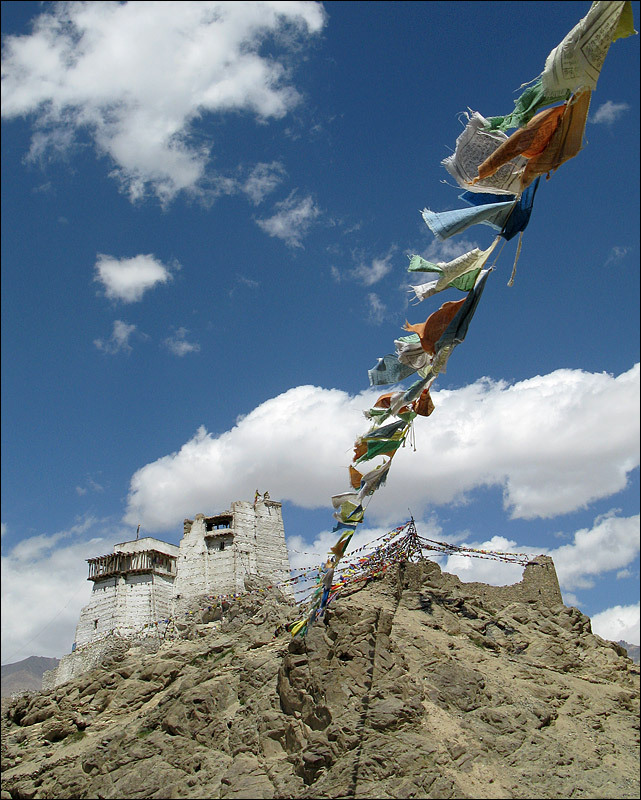 ), and provides philanthropic support for various projects in the area, and she’d been a valuable source of advice and information for us while we were acclimatising in Leh, over many cups of tea in the Penguin Bar. 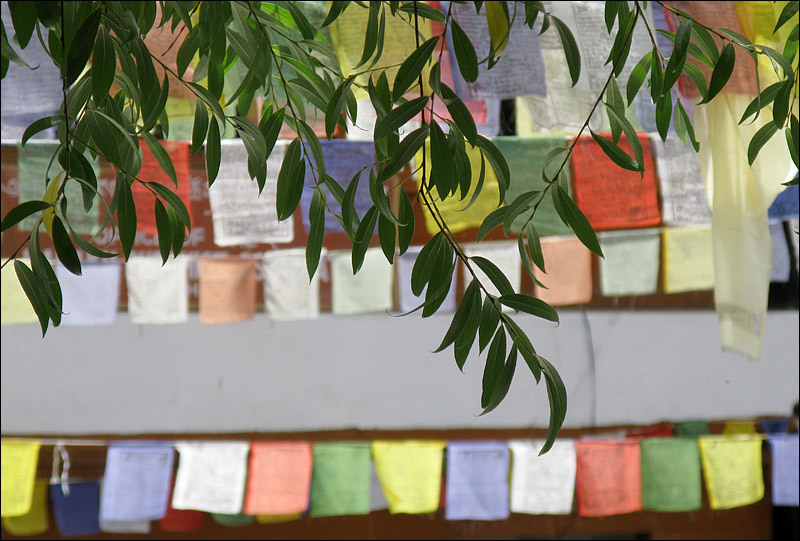 Anyway – After some enthusiastic greetings, it was decided for us that we should stay at a Tibetan School in a little village called Puga Sumdo. 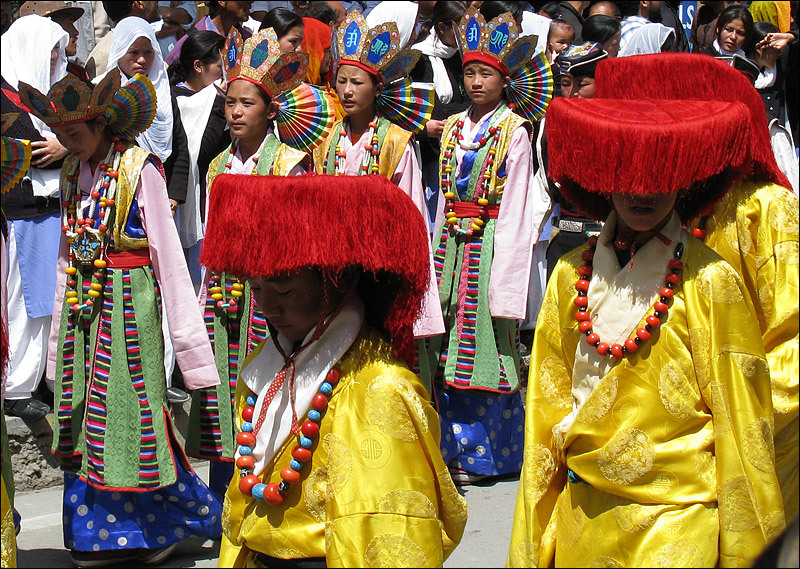 It turned out that Elisabeth’s companion is Director of the Tibetan Schools program in the area, and she wrote a short letter (in Tibetan) in my journal, and instructed us to show it to the School staff when we got there. The village of Puga Sumdo. Snow started to fall just after we arrived, so it was great to know we’d have a proper roof over our heads that night. It was a real privilege to be able to spend some time with the kids in the school. 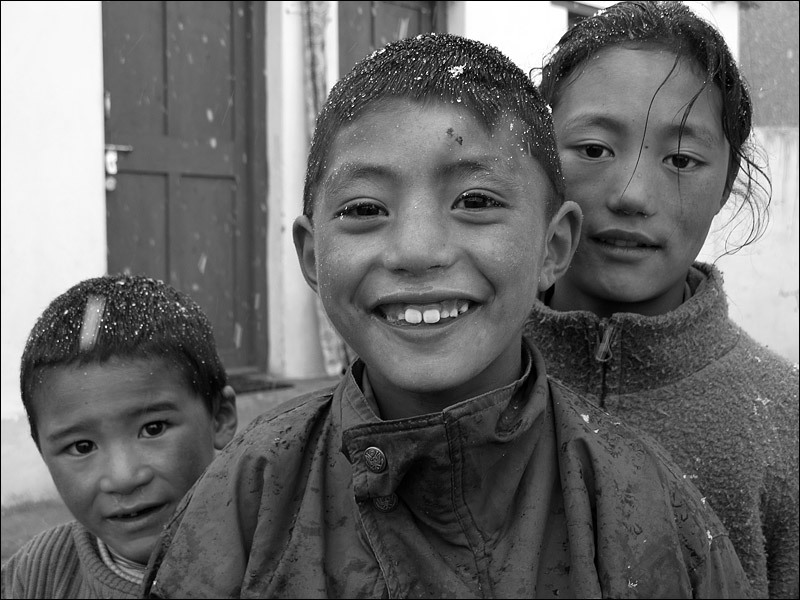 Their parents are all still living in Tibet, so in practical terms the school runs a bit like a cross between a boarding school and an orphanage – life is hard for them, but they smile all the time and have the rosiest cheeks in the world! 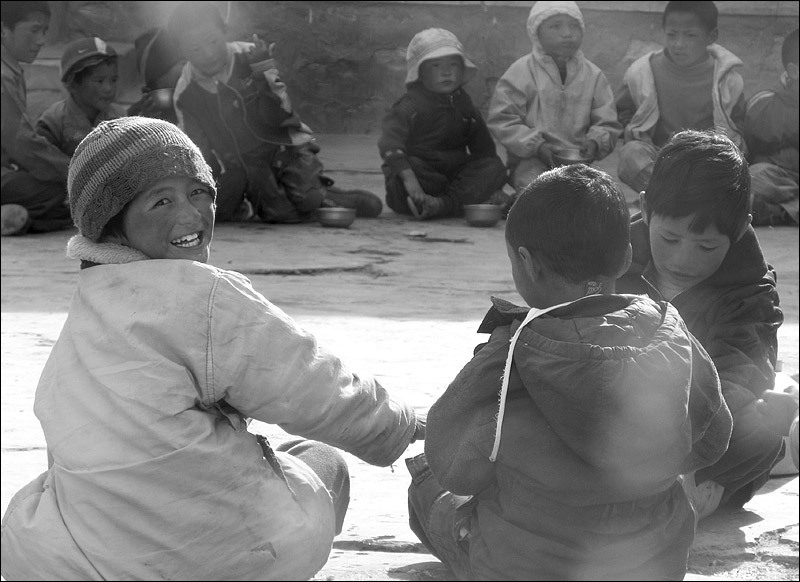 The kids were being taught very basic English in the school, and had *just* enough grasp for us to communicate in a combination of English, Ladakhi and farmyard animal sounds. So Ulrike and I spent some time entertaining the kids by answering requests for “HORSE! !”, “PIG! !”, “COW! !” etc. When we got to “YAK!! !” my throat was a bit sore, so I started a new game – teaching the kids how to ‘thumb-wrestle’. This went down a storm, and a huge queue of children formed, all wanting to take on the Champ. Of course you have to let the kids win every now and then, and this caused some of the boys to almost wet their pants with excitement! Anyway. After a few games, a couple of the most excited boys started jabbering, and they grabbed one of the boys from further back in the queue and pushed him forwards. He was a wee bit shy and I wondered what was going on, but encouraged him to take my hand for a bout. And then I saw what the fuss was about! Blimey! The little guy had two thumbs!! On both hands he had an extra thumb! I tried my best to be polite and un-phased by this, and I put on a good show but let him win almost all of the games, which made him champion of the world! It was a real treat to see his beaming face while the whole school was cheering him on. However, I’m sure there must be something in the rules about the maximum permissible number of thumbs in any thumb wrestling game. 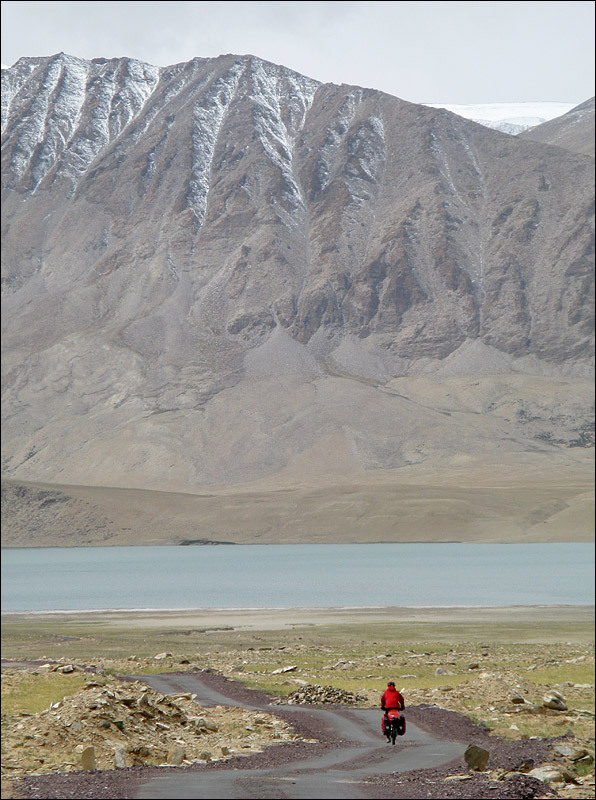 Approaching Kiagar Tso, a stunningly beautiful little lake on the road to Tso Moriri. 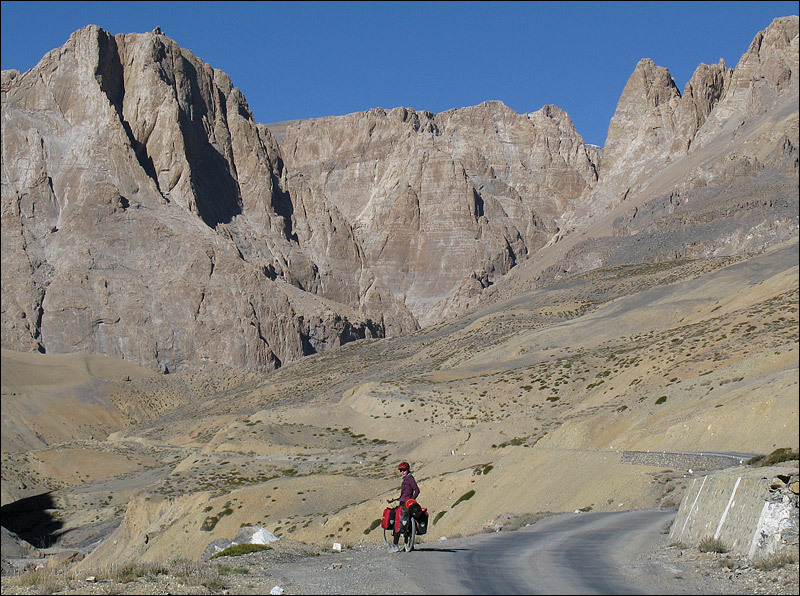 Sadly, the tarmac road finished at Kiagar Tso, and we had about 30km of rough track to ride before we’d reach Korzok, the little village on the shore of Tso Moriri. There were some *really* bad sections on this road, where jeeps had created a washboard pattern which caused very bad vibration, even with suspension I thought my spokes were sure to break. It was so bad in places that jeep drivers have decided to go ‘off-road’ and had created giant diversion loops, but those sections were mostly off-limits to us because the sand was too soft. This was probably the most arduous section of the whole trip. But worth it? What a fantastic view over the lake. 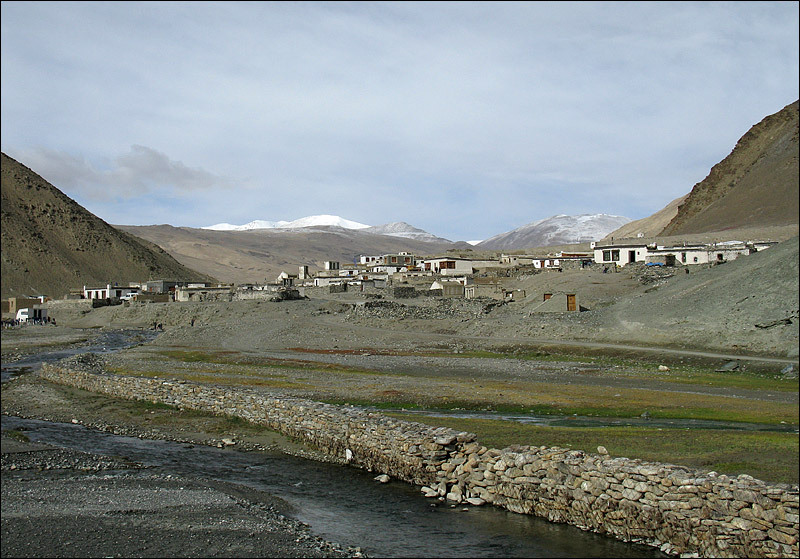 Korzok (the only village on the Lake) is a dump though – it’s dirty, there’s restricted camping, and the people aren’t very friendly – too used to begging from tourists on Jeep safaris. 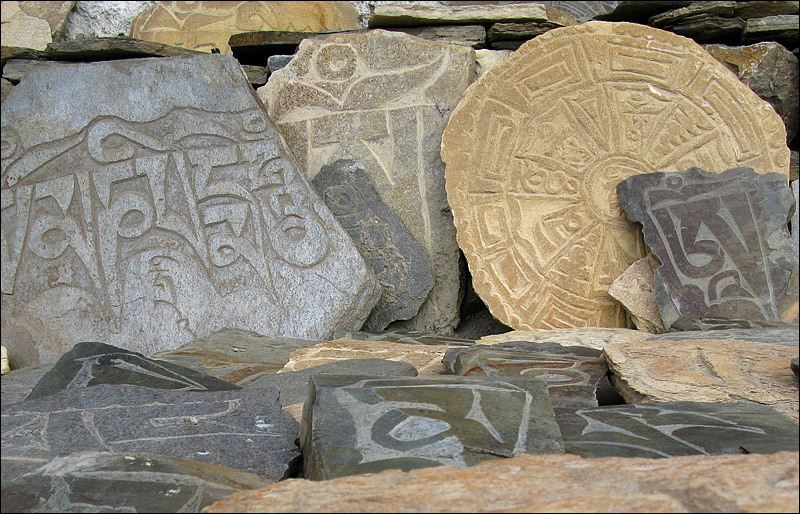 Mani walls are very common around gompas & stupas; these stones were part of a wall in Korzok. 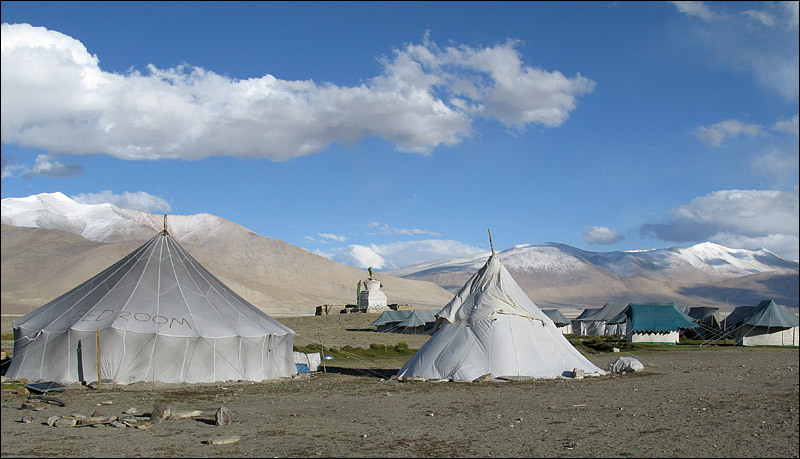 This is Pongunagu (4,590m), on the shore of Tso Kar – in common with many places which appear on the maps, we expected some kind of village but found only a few tents. Pongunagu consists of a couple of rival tent hotels, and one tea-tent with a ‘bedroom’ tent beside it. We decided to stay in the bedroom tent (the wigwam in the centre of the picture) because it was the cheapest option, and looked perfectly comfy inside. In fact however, because it was roomy, and had a giant hole at the top, the temperature inside the wigwam dropped to about -8deg at night. Nippy. Black tea, mango juice and some dry toast was a fairly standard breakfast on the trip. 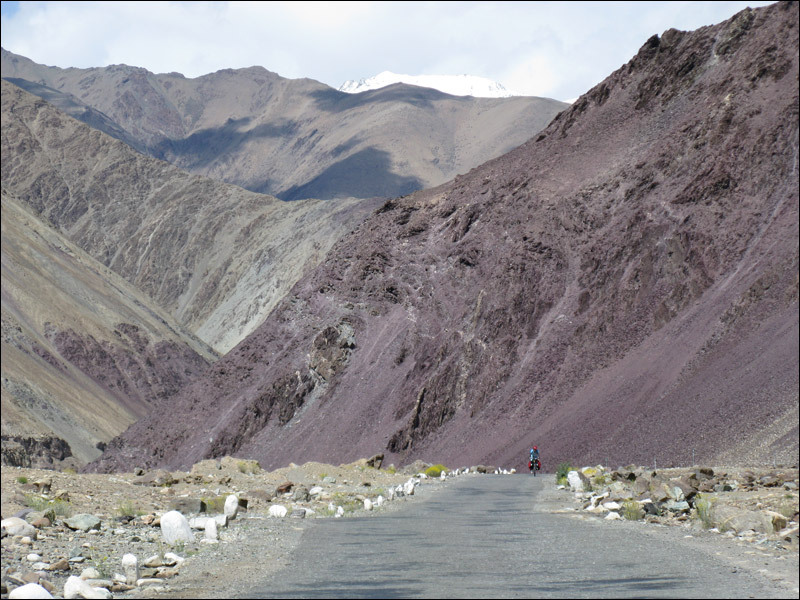 Once out of the Tso Kar basin, we joined the main road south to Manali, just in time for the More Plains – a huge, flat, featureless plateau where we had to fight a relentless headwind for about 30km – hard work. To make matters worse, road-repair crews were working at 2km intervals all the way along the road, and had created diversions which required us to skirt around the works in really deep, soft sand – our tyres just disappeared as if it was quicksand. 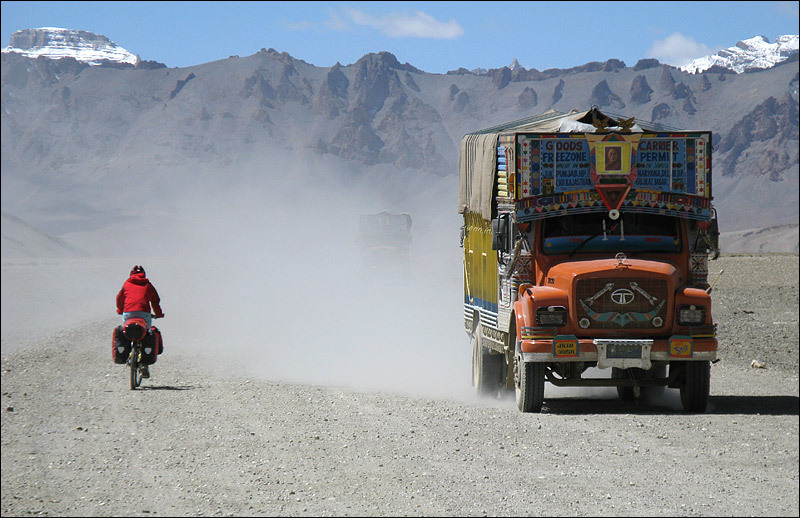 Also, because we were back on the ‘main’ road, we had to deal with the Tata trucks which would thunder past, filling the air with dust and diesel fumes. At that altitude (around 4,700m) if I tried to hold my breath for even a few seconds while pedalling, I became dizzy, my knees went weak and I fell off the bike. Not recommended when a convoy of giant trucks is passing! 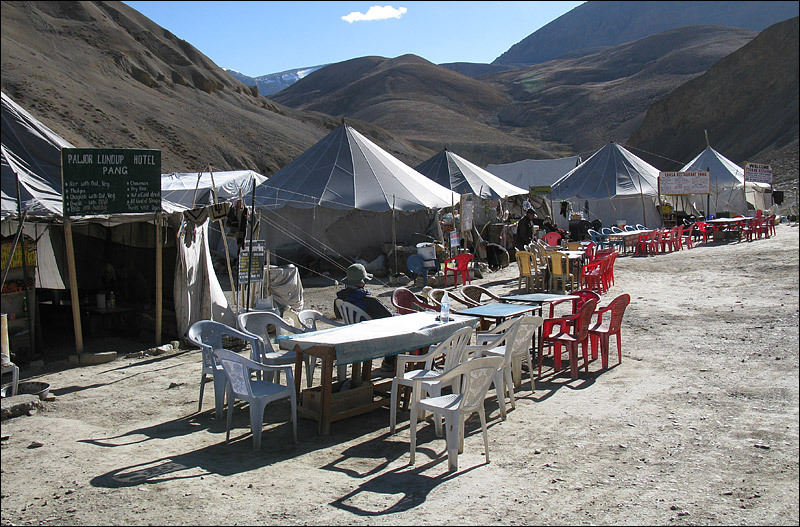 At the end of the More Plains, there’s a fantastic, short, steep descent into Pang – another place which we thought would be a village, but in fact is just a bunch of little dhabas (drink/chapati/omlette tents). They have extension tents at the back where people can sleep however, and we were so tired at the end of that windy day on the plains that we chose to try out that option rather that find a place to put up our own tent, but that was a big mistake. At 5am we were woken up by the first of a non-stop convoy of trucks who stopped and expected to be fed, and expected everyone to be impressed by their horns, revving engines, and their subwoofers. Jeez. I was also a bit congested and freezing cold, and if it had been possible to presss a button and be taken home right there, I wouldn’t have hesitated. 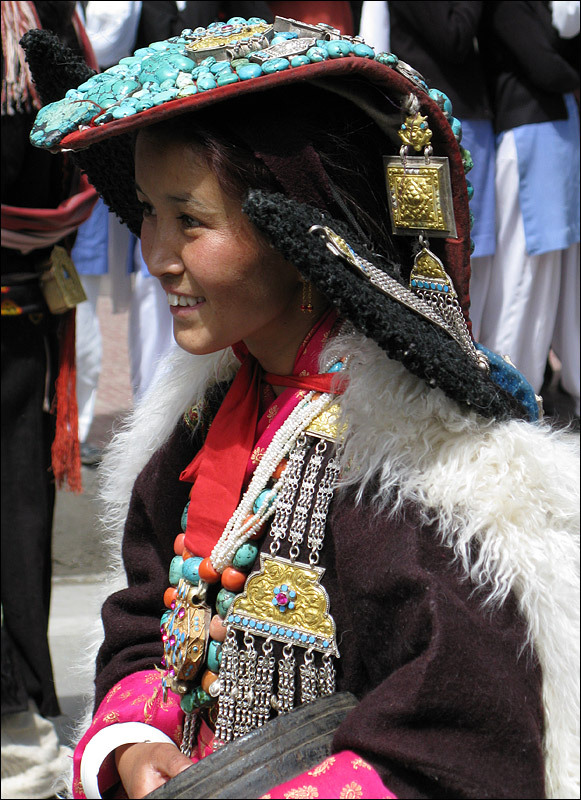 Pang was probably the lowest point of the trip for me, spiritually speaking. On the road to Lachalung La. After such a bad night and rude awakening, I wasn’t looking forward to the big climb (up to 5,065m), but in fact it was a great day. Tiring for sure, but the scenery was amazing. 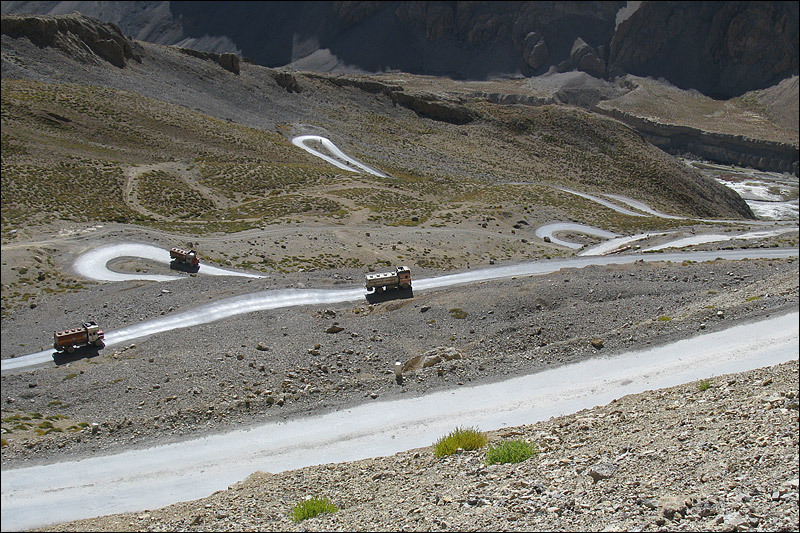 The Gata Loops – 21 hairpin bends and last part of a 700m descent to the Lingti Chu river. Brilliant! 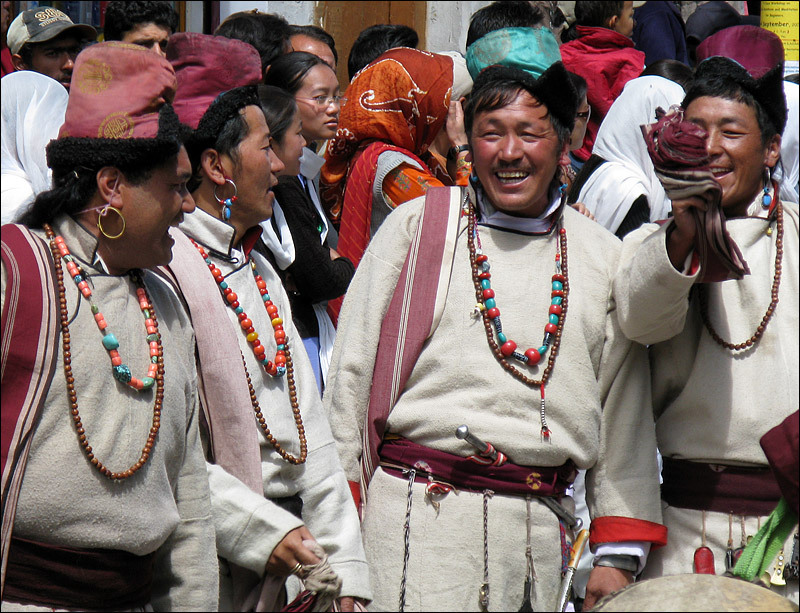 The Lingti Chu. 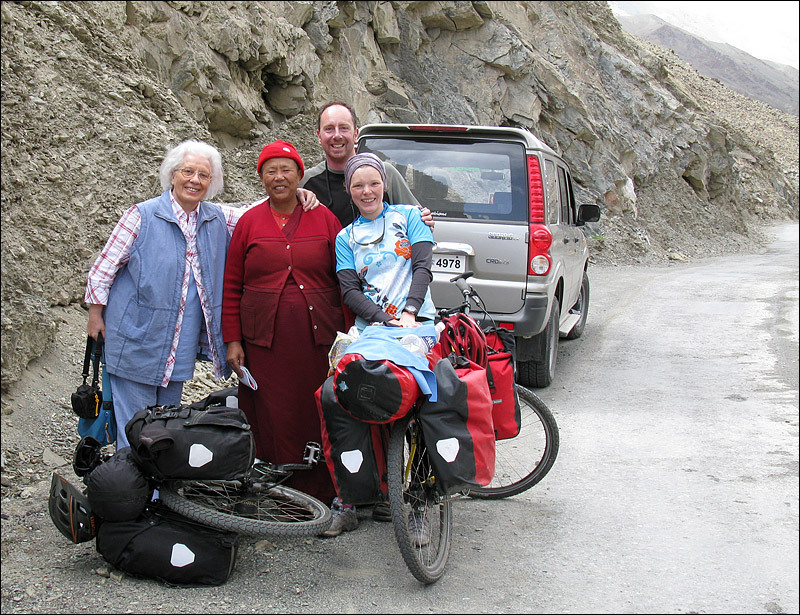 We camped just at the foot of the Gata Loops, and were fortunate enough to bump into a supported tour who were coming the other way, led by Ruedi Christen. He invited us to join them for dinner (three courses and coffee!) in their dining tent, and we were able to pick their brains about the stages of the tour they’d just completed – what lay ahead for us in the next few days. 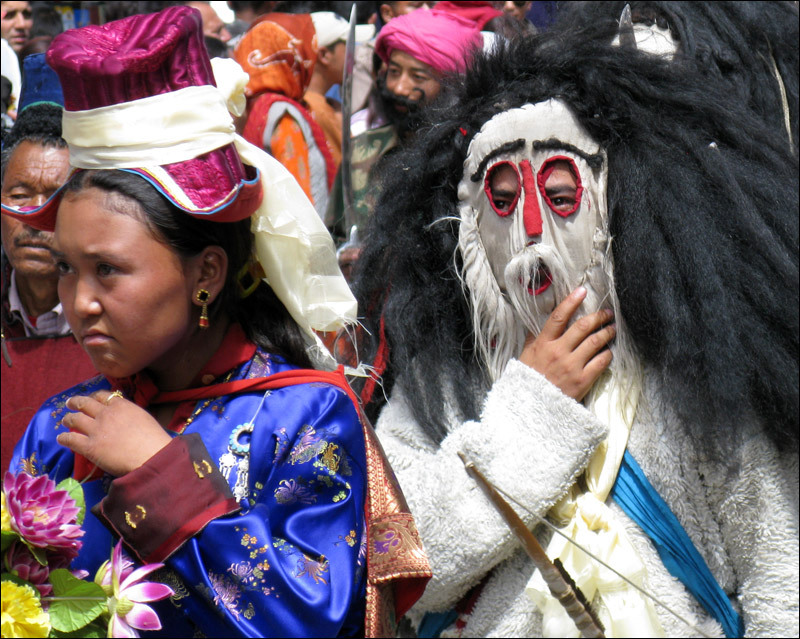 I’m not sure it was very helpful, given that they were coming the opposite direction, and weren’t carrying any luggage – their experience was obviously very different to what we should expect. 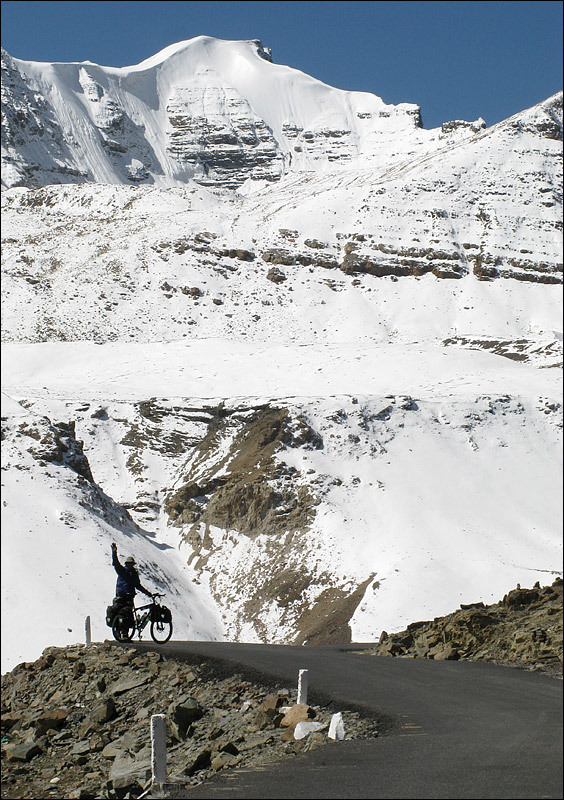 But a supported tour does look like fun – all you have to worry about is cycling! The crew carry all your luggage, tools, spares; they build and dismantle camps, including toilet tents, dining tents, kitchen etc; all food & drink (including beer if you want it) is included in the price. Easy! I chose to take wet lube with me, which wasn’t ideal in the dirt & dust. The chains were brand new at the start of the trip though, and we were more than half-way through our tour, so we didn’t bother cleaning them until we got to Manali. 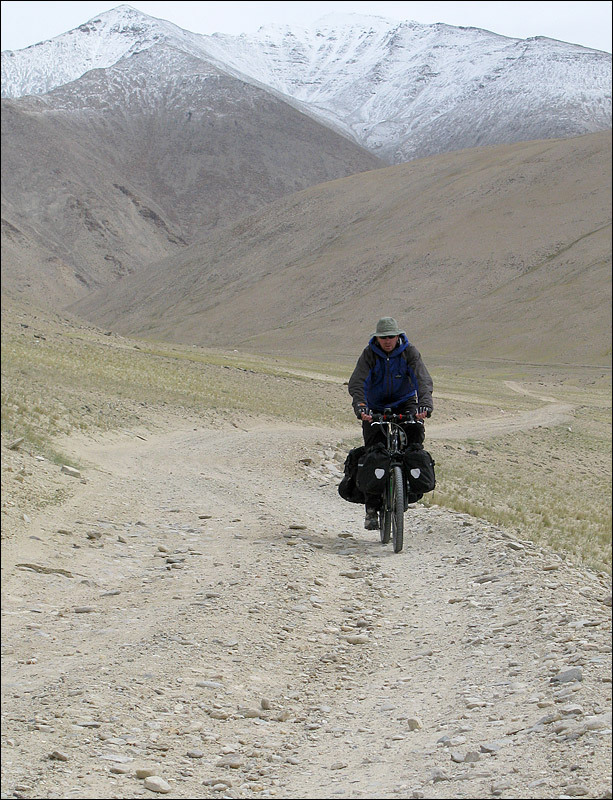 After stopping for lunch in Sarchu (another little dhaba settlement), we carried on to get as far up the Baralacha La road as we could, but not higher than we felt was safe to camp. 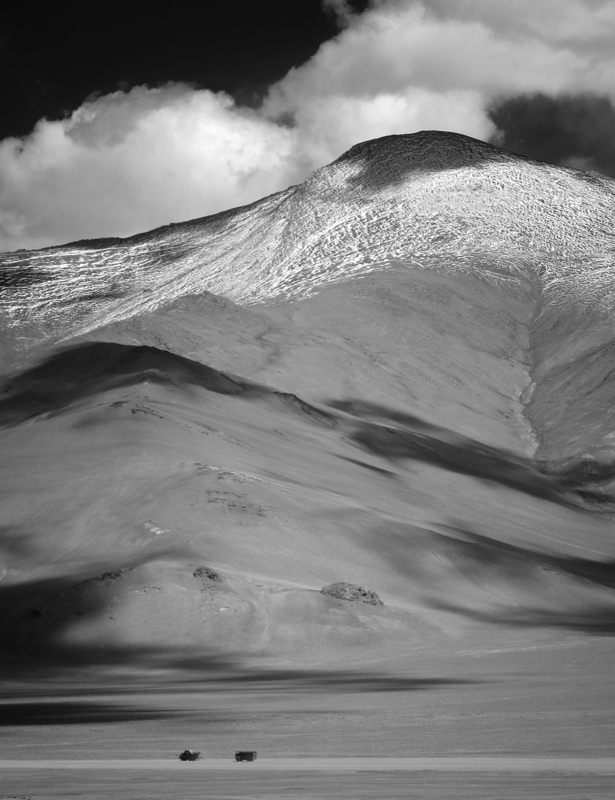 The height of the pass is 4,980m, but we camped here, next to a dry lake, at around 4,700m, so we had an easy climb in the morning. It was VERY cold though – we woke up in the morning to find the whole of the inside of the tent coated with ice, and my watch showing the temperature inside the tent to be -10deg. (the ice was my fault – the ground was very sandy and I was worried about the tent catching the wind and ripping the pegs out, so I’d sealed up most of the ventilation options). Our clothes were frozen stiff! However, as soon as the sun touched the tent we started to thaw and climbing out of the sleeping bags didn’t seem quite so daunting. 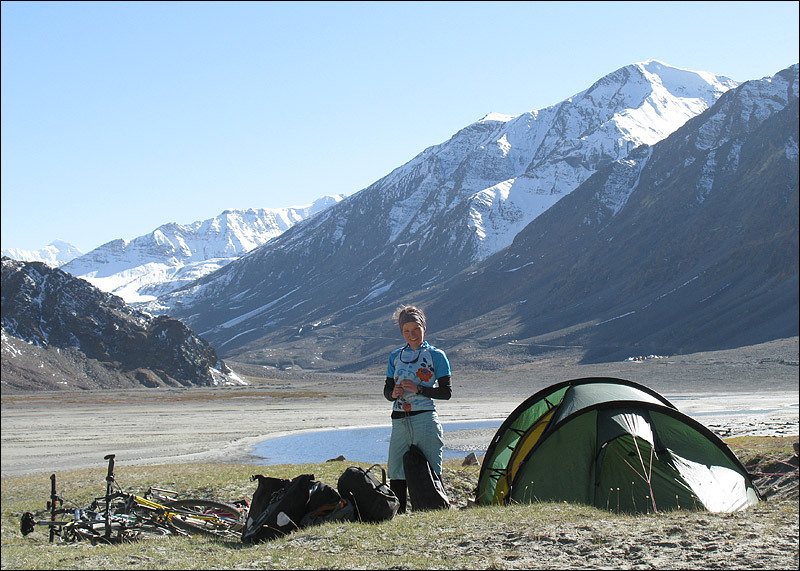 I think that morning was the highlight of the whole trip for me – I had to break the ice in the little stream beside the tent to wash my face, and after that I sat for a few moments looking at the mountains all around and the sun shining on the tent. It’s a wonderful place. What a great thing! 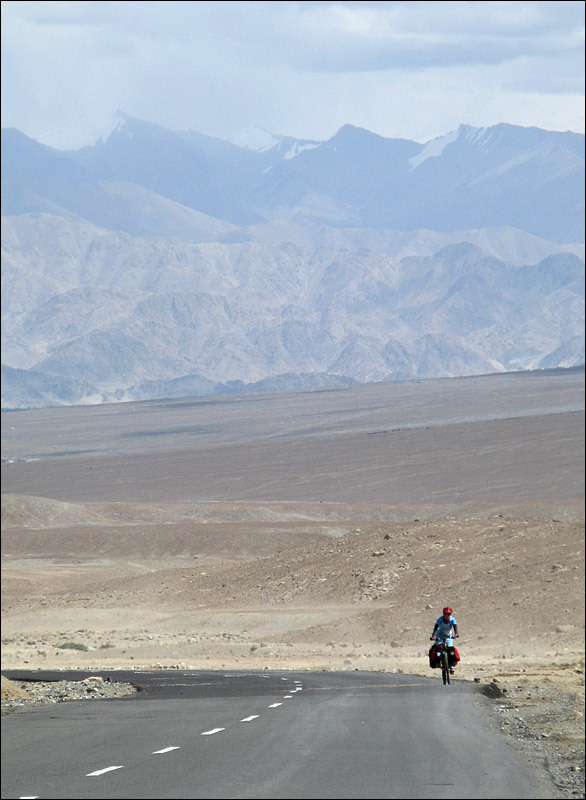 This photo makes me want to just jump on the bike right now and go somewhere new. On the descent after the pass. Look at the quality of the road!!! 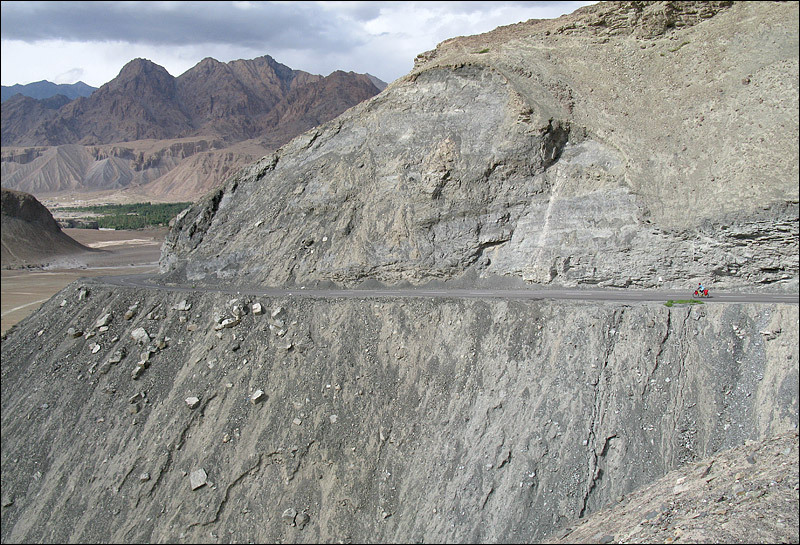 I hasten to add that this was exceptional – most of the road on the rest of the trip was in pretty bad repair because of landslides and abuse by convoys of trucks. 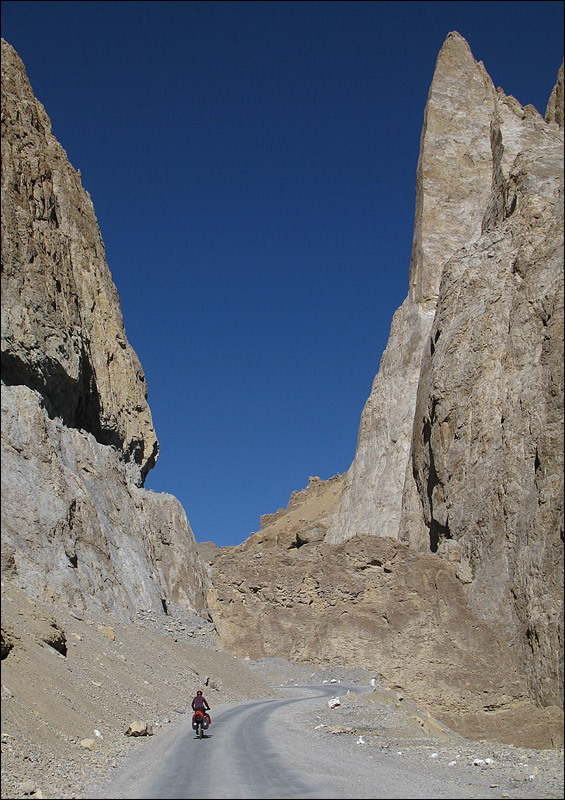 On some sections of road, around Tso Moriri, and on the road between Keylong & Khoksar (above), there’s just no surface at all – it’s rough track most of the way. 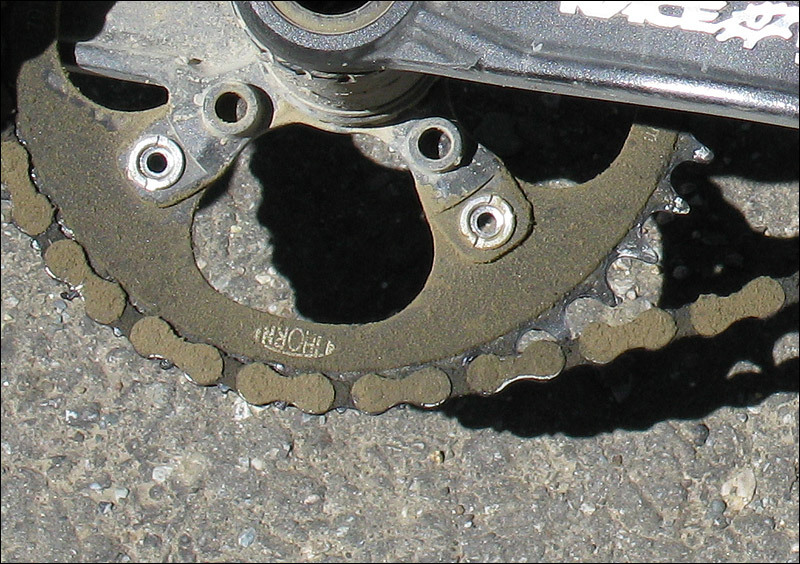 In fact there are bits which are like trying to cycle on a dry stream bed. 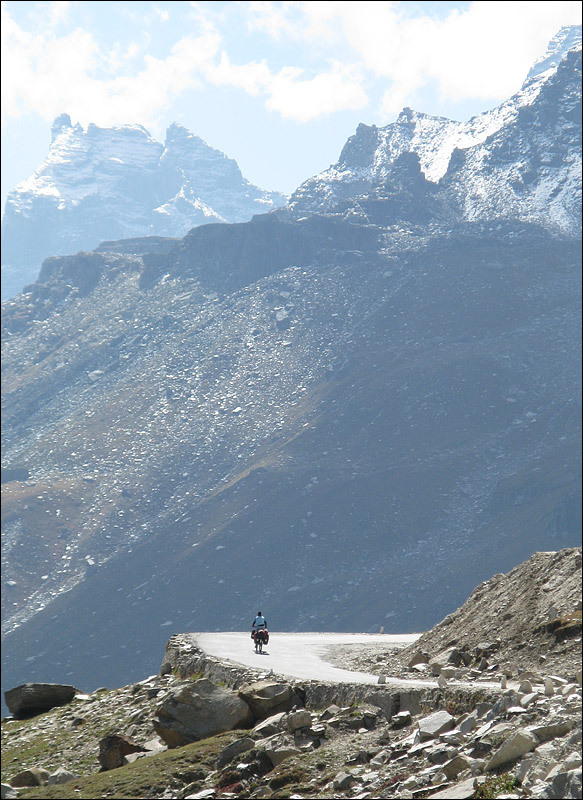 Somewhere near Sissu, on the road to Khoksar. 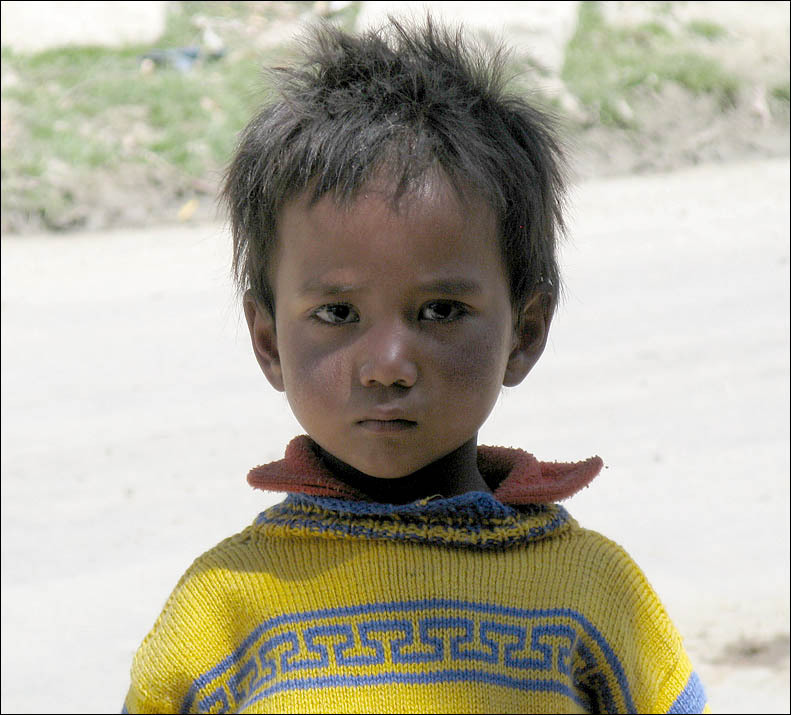 We stopped at a little dhaba for paratha and pepsi, and this little guy was fascinated by us and the camera. In fact it was kind of spooky after a few minutes – he just kept on staring like that! 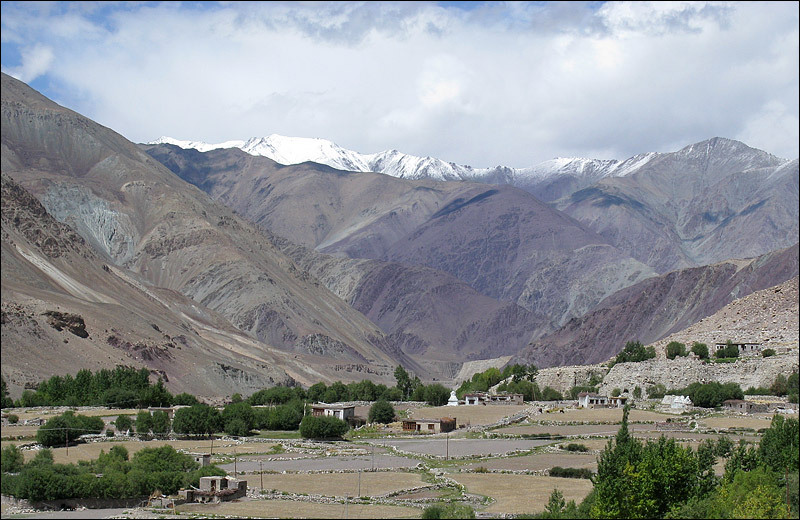 Looking east into Spiti Valley, from the climb up to Rhotang La. 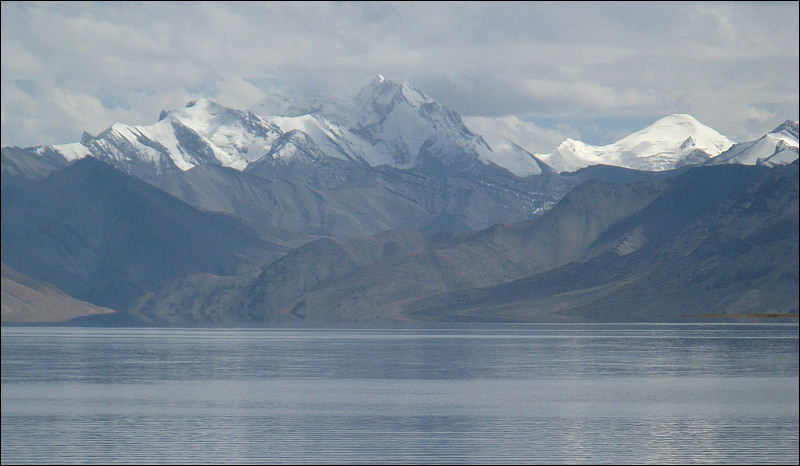 The tallest mountain in the distance is Shilla (7,026m). 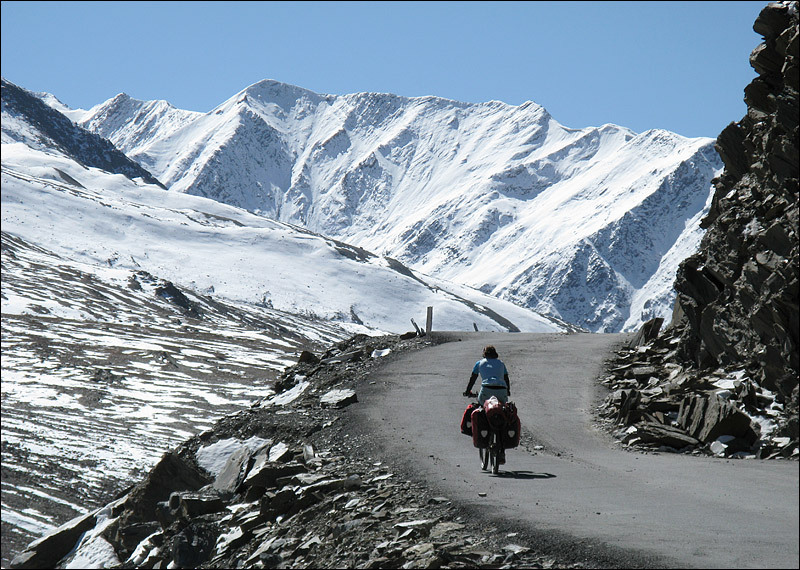 We’d originally planned to cycle into Spiti for a few days before returning along the same road to climb Rhotang La on the way to Manali. However, by the time we reached the junction we were ready to call it quits, and the lure of a hot shower in a hotel just over the hill was enough to clinch the deal. 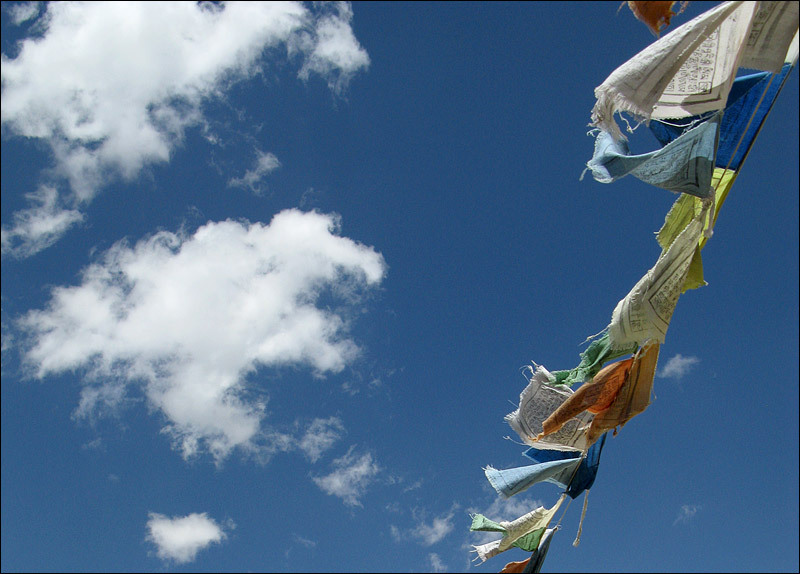 Spiti can wait for another day. 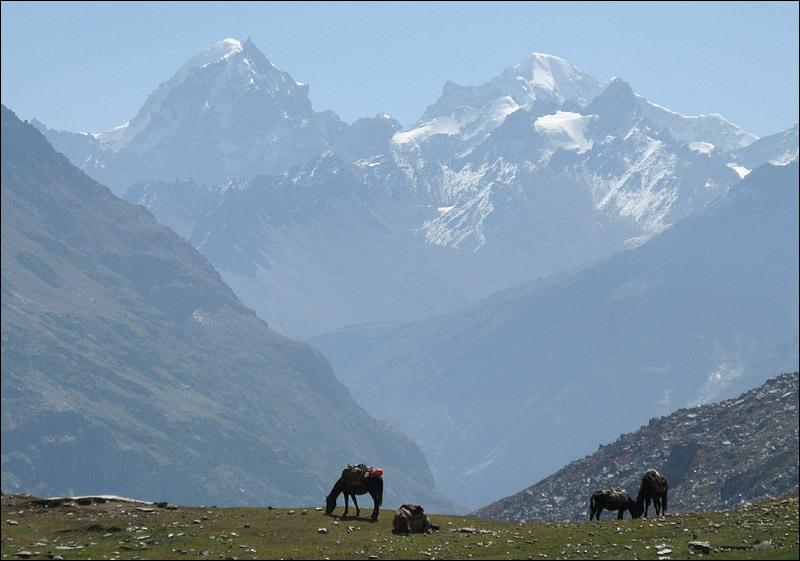 In fact we made the right choice – the day after we took this picture the weather turned nasty – it rained non-stop for three days in Manali, and this fell as snow on Rhotang La and Kunzum La (the big pass in Spiti). 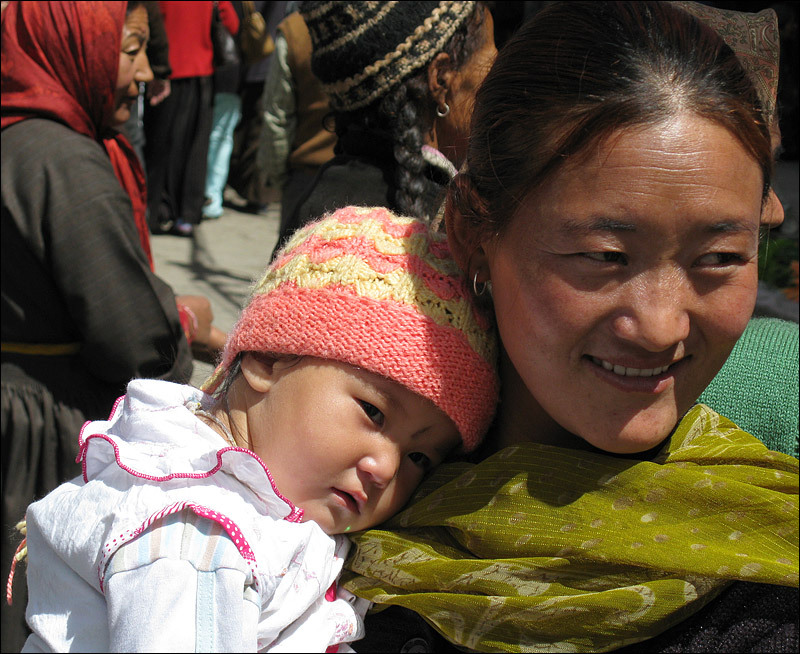 We read in newspapers later that many people had been stranded around Kunzum La for more than a week, and several people died. 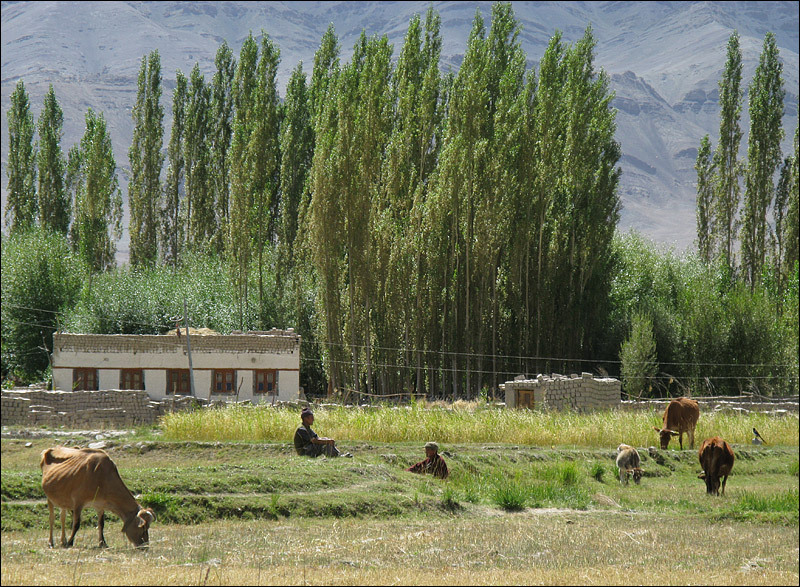 Another view of Shilla with some pack horses in the foreground. Near the top of Rhotang La. 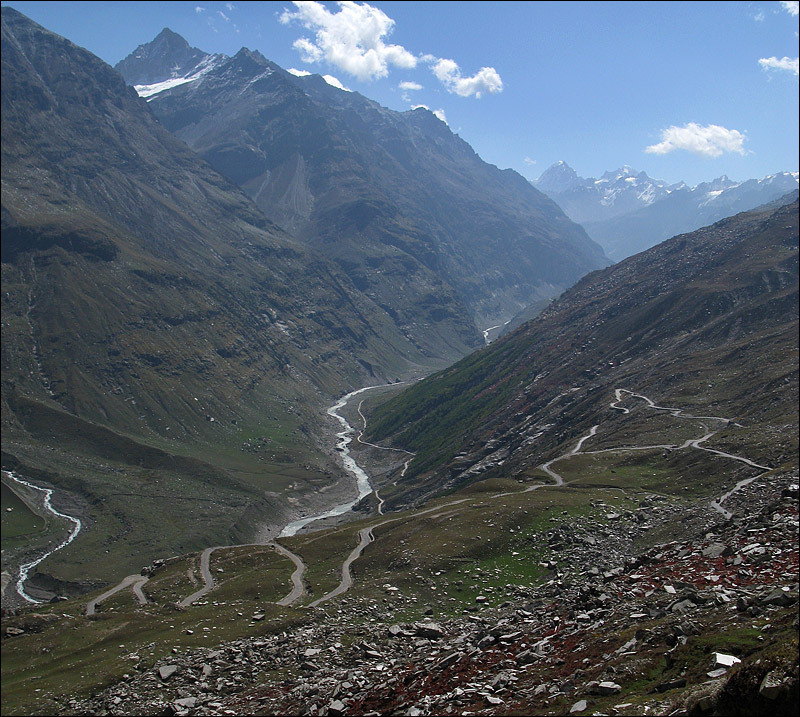 On the other side of the pass, the road drops 2,000m into Manali. 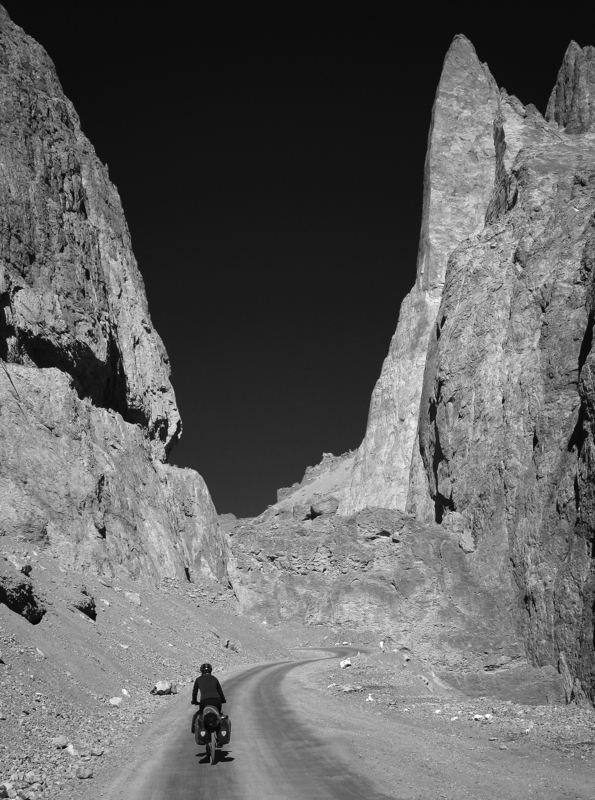 The road becomes busier, the landscape greener, and my heart sank because I knew we were leaving the mountains behind. 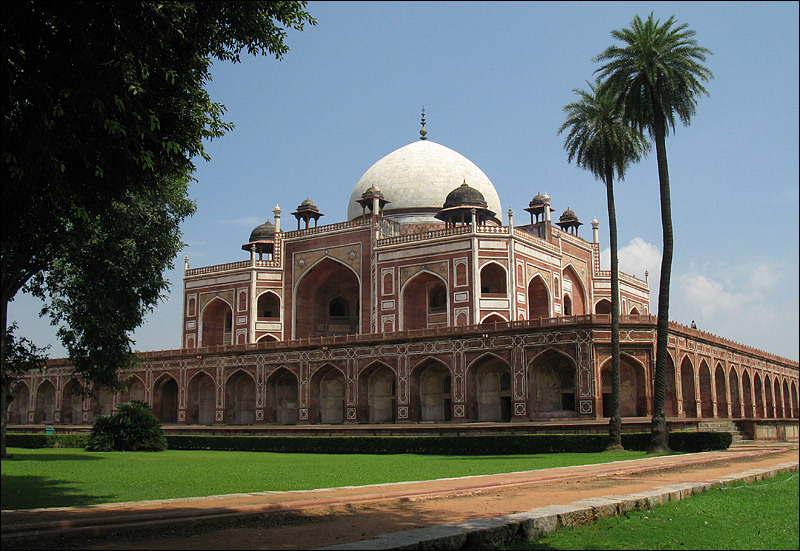 Humayan’s Tomb in Delhi. 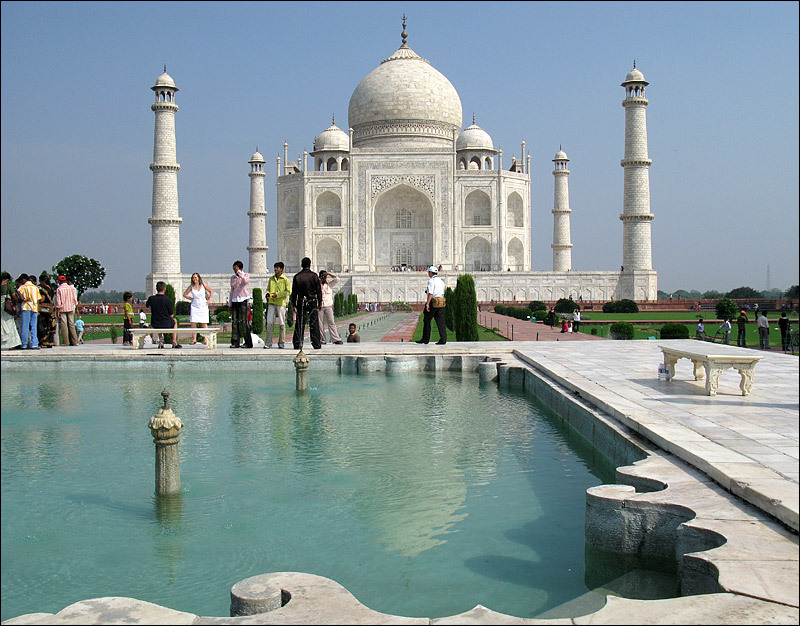 A very beautiful place, with architecture which predates theTaj Mahal. In India, you have to regard ALL water which isn’t in sealed bottles as unsafe – you never know what kind of organisms might be floating about in it. 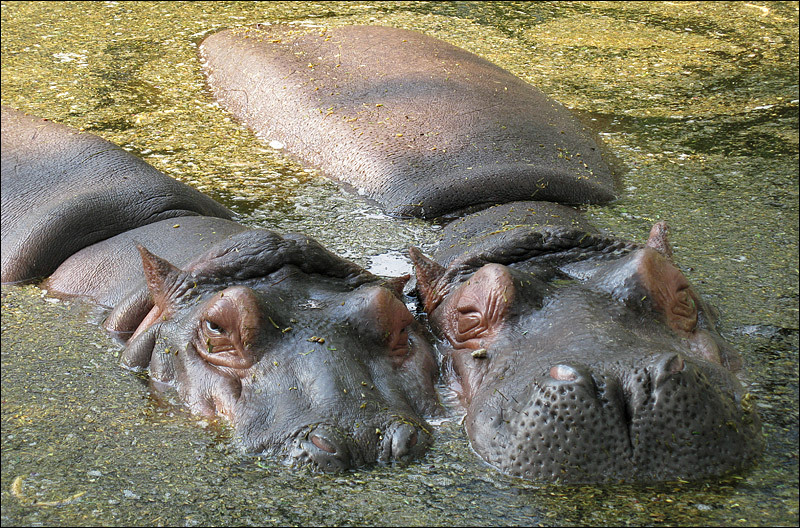 Actually this was taken in the Delhi zoo, where we tried to escape from the noise and bustle of the streets for a couple of hours. 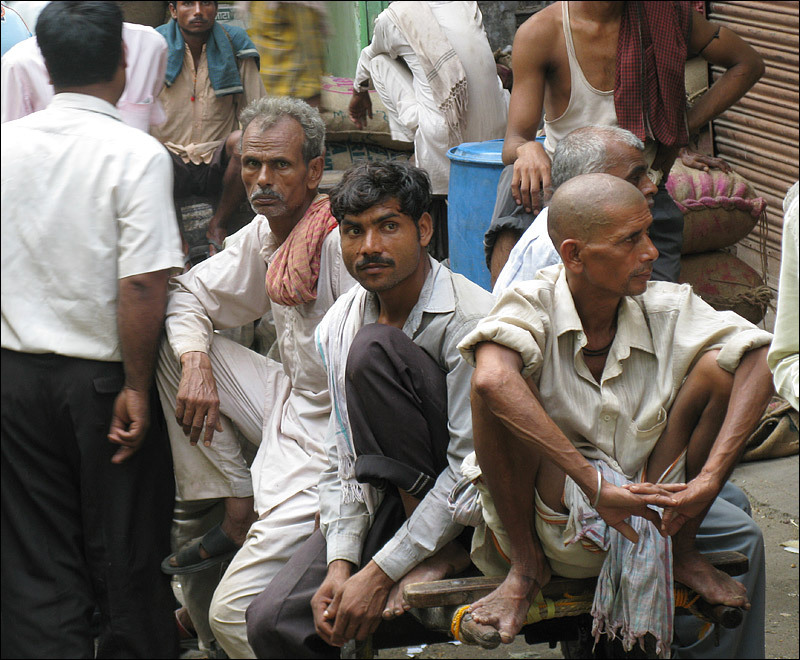 The city was a bit of a shock to the system: after such a long time in the mountains where we met only friendly, curious, generous, hospitable people, it was saddening to experience the non-stop pressure from touts, con-men, beggars and cheats. 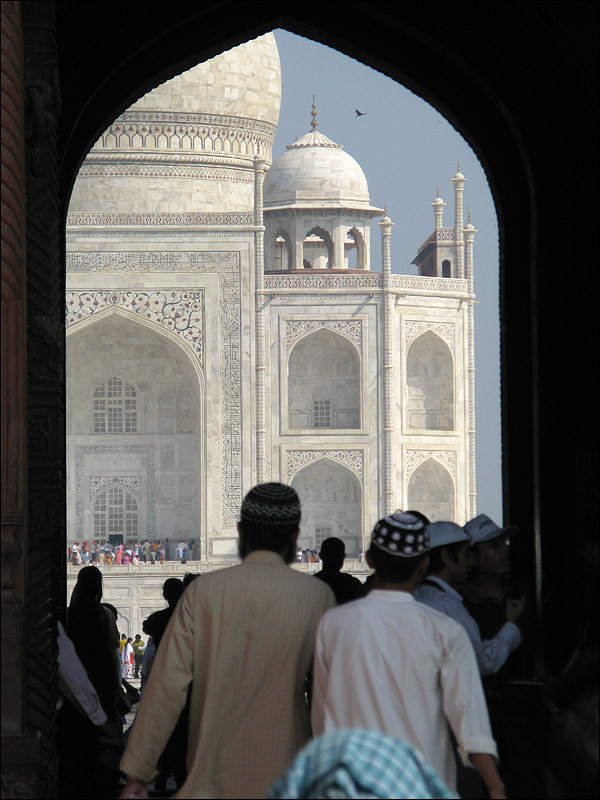 First glimpse of the Taj Mahal in Agra. Truly amazing, beautiful thing. 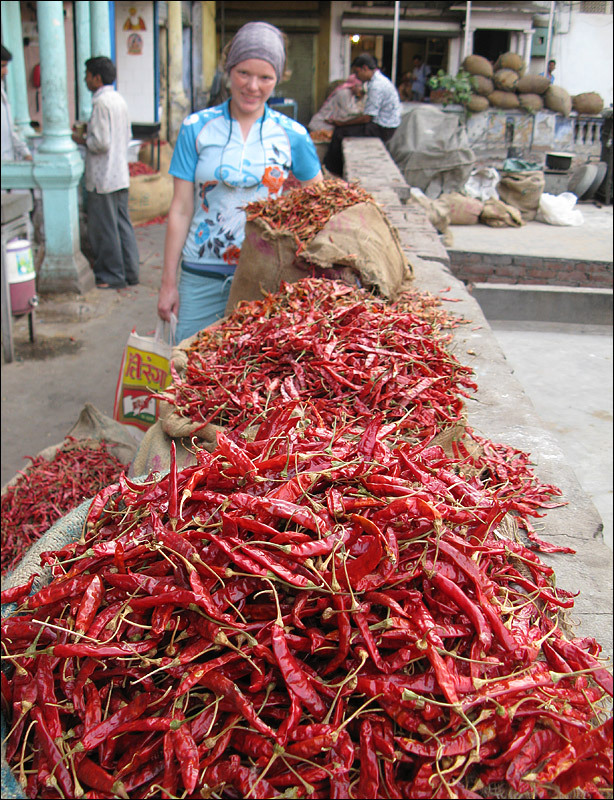 Back in Delhi, in the Spice Market. 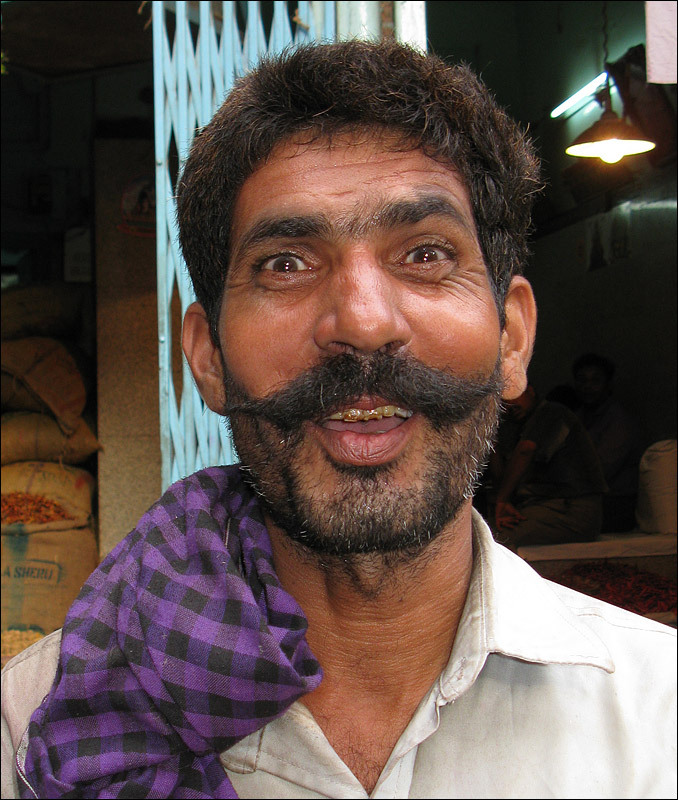 This cheeky chappy saw Ulrike with the camera, and set about styling his moustache for a portrait. And again! 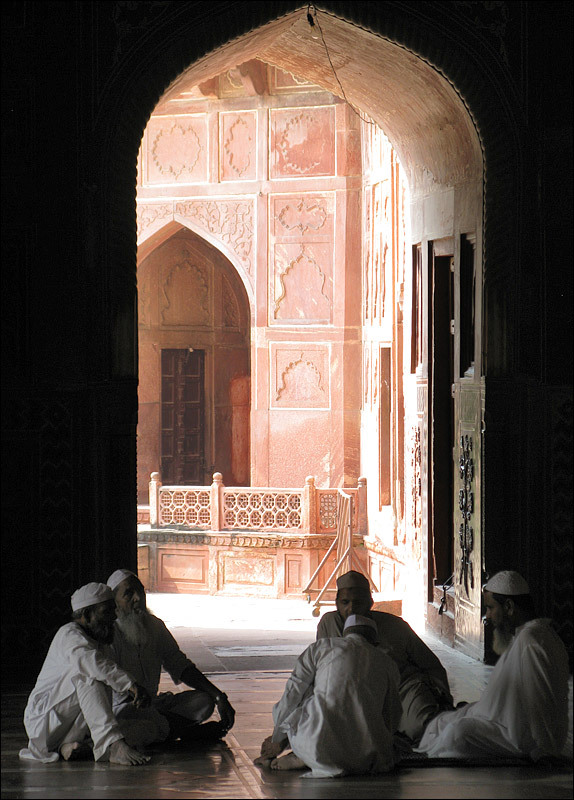 My favourite shot of the trip! 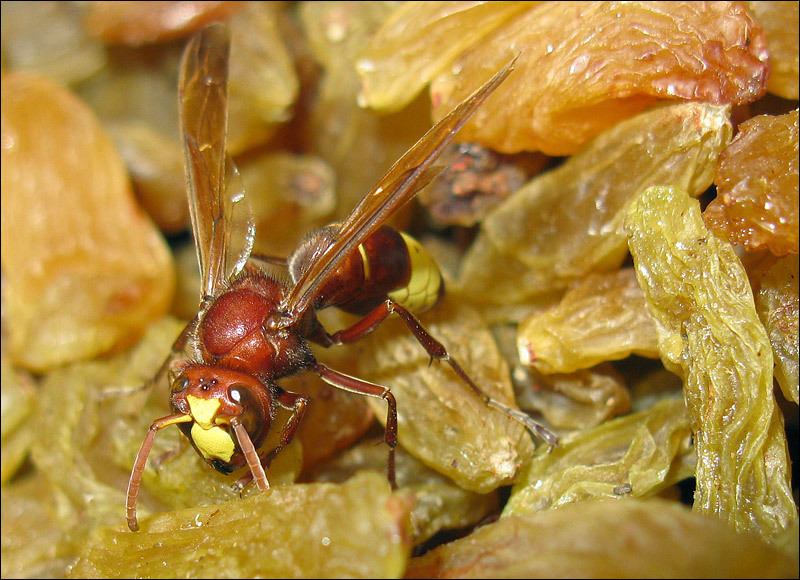 This wasp was buzzing around a huge bag of sultanas. Most streets in Delhi were just like this: crowded with people, rickshaws, motorcycles, and all manner of ‘things’ being transported in the most precarious ways. 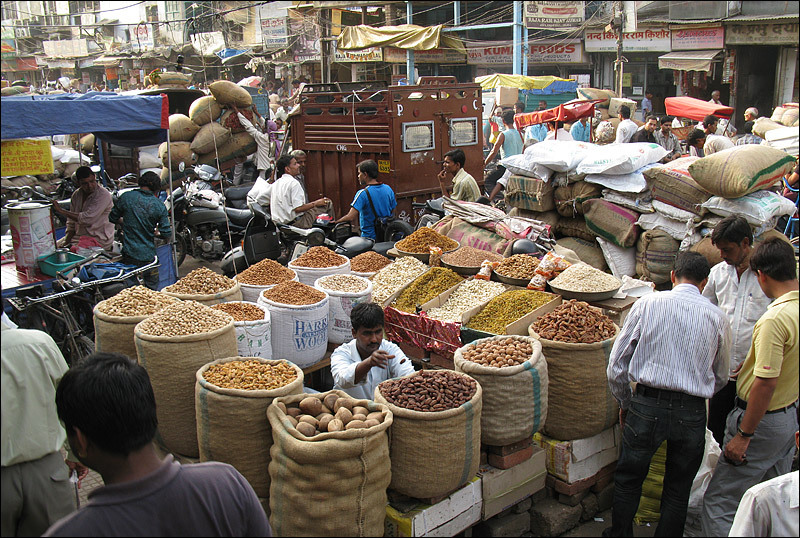 Busy, noisy, smelly – Delhi is a relentless assault on the senses. Wow! What an adventure. 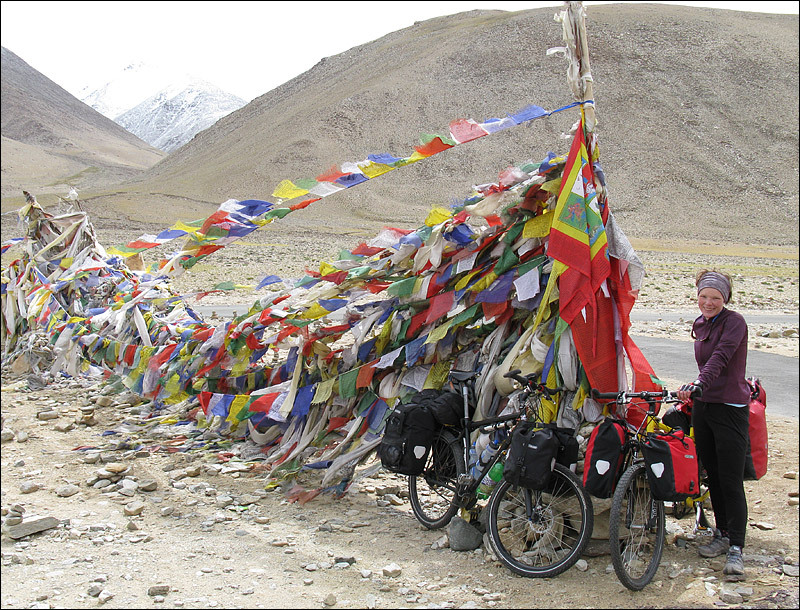 This looks like a great part of the world for a bike tour. You took some very good photos along the way as well. Thank you! 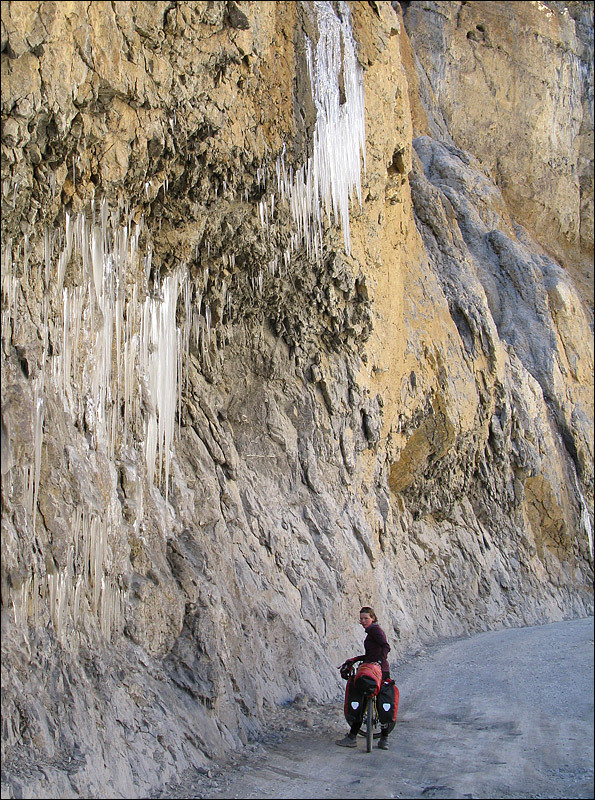 I thoroughly recommend the route, and the area in general – the riding is often hard, but the people are genuinely hospitable and kind, and the landscapes amazing. 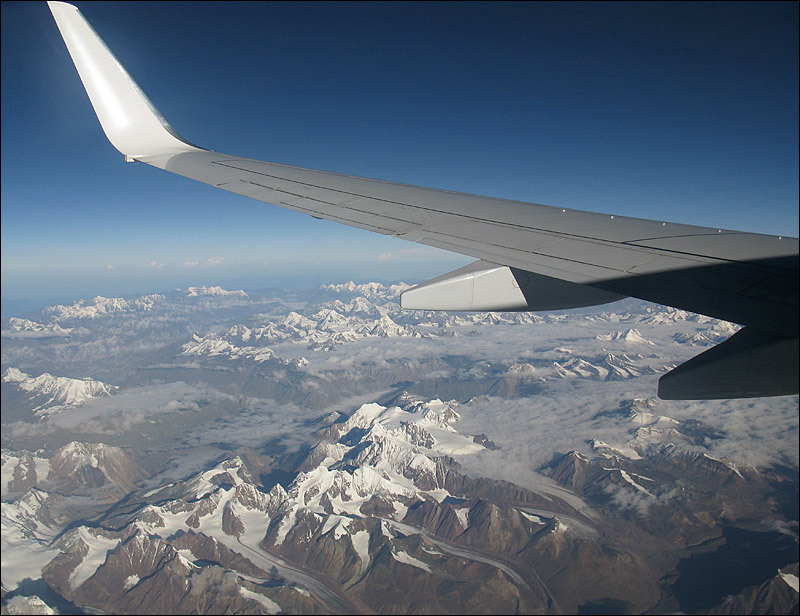 Buy your flights now!